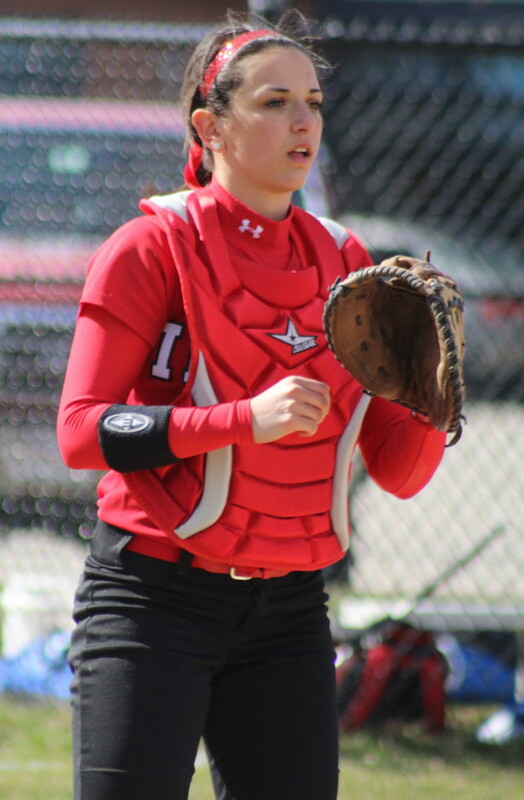 (Amesbury MA) Rachel Cyr struck out nine and drove in three runs leading Amesbury past Notre Dame Academy (Tyngsboro) 11-2 in the Division 3 North quarterfinals on Tuesday afternoon. 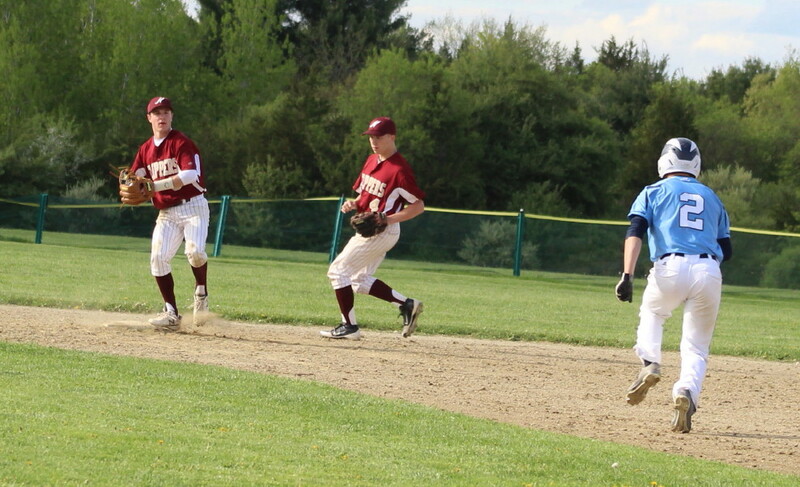 Next opponent for the Indians (16-6) will be Lowell Catholic on Thursday night (6:45PM) at Martin Field in Lowell. 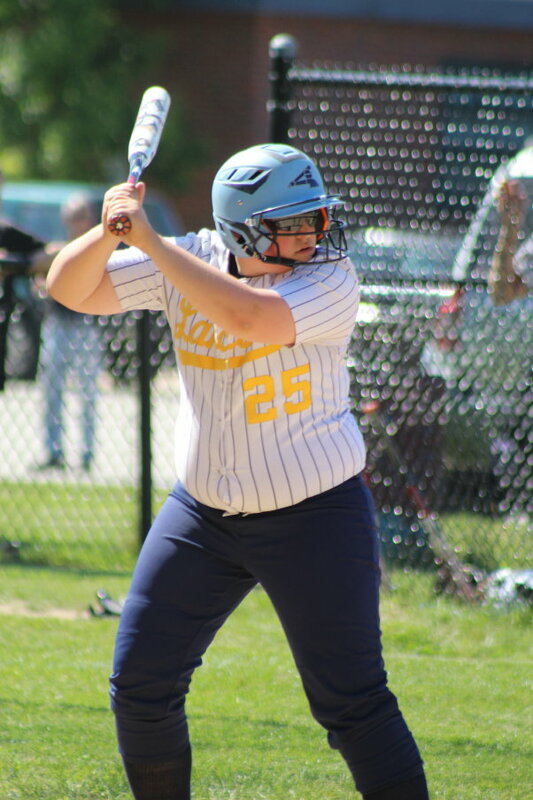 This was a 2-2 game after 3 1/2 innings but Amesbury put up a six-spot in the fourth and the team from the Commonwealth Athletic Conference never recovered. Rachel Cyr was extremely effective. 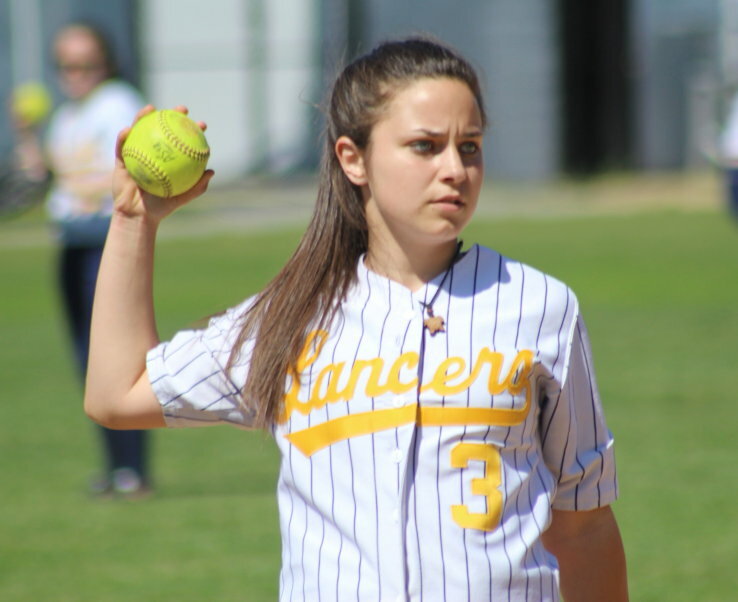 The AHS senior threw strikes (no walks) and K’d nine of the Lancers. She also retired the last seven batters she faced to thwart any comeback plans NDA may have had. The Indians jumped off to a 2-0 lead with single runs in the second and third. Rachel had a part in both runs. In the second, she singled to deep short and her pinchrunner (Liv Stolworthy) came in on Zoe Fitzgerald’s single to short left. 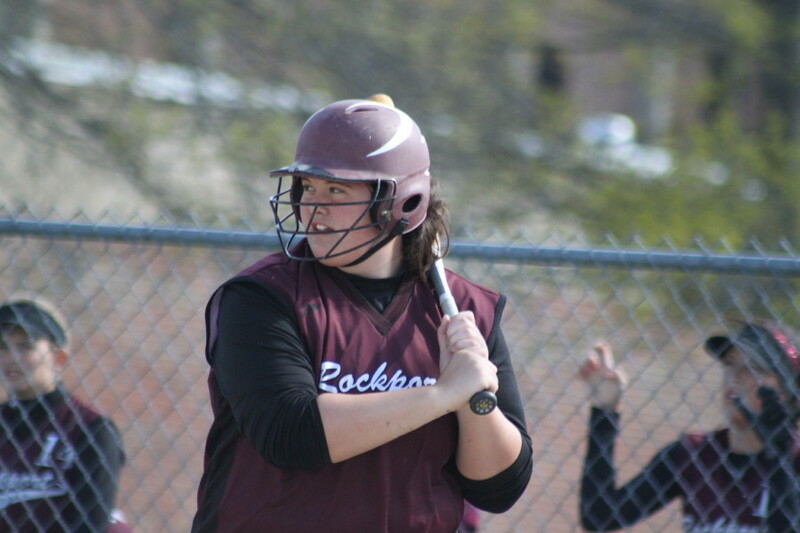 In the third, after teammates Alexis Boswell and Autumn Kligerman reached, Rachel had an RBI single up the middle. The Lancers (12-11) rallied back to tie the score in the fourth inning. After Kendall Liggett singled, Regan Szekely doubled hard down the first baseline scoring Kendall. Breanna Richard ran for Regan. 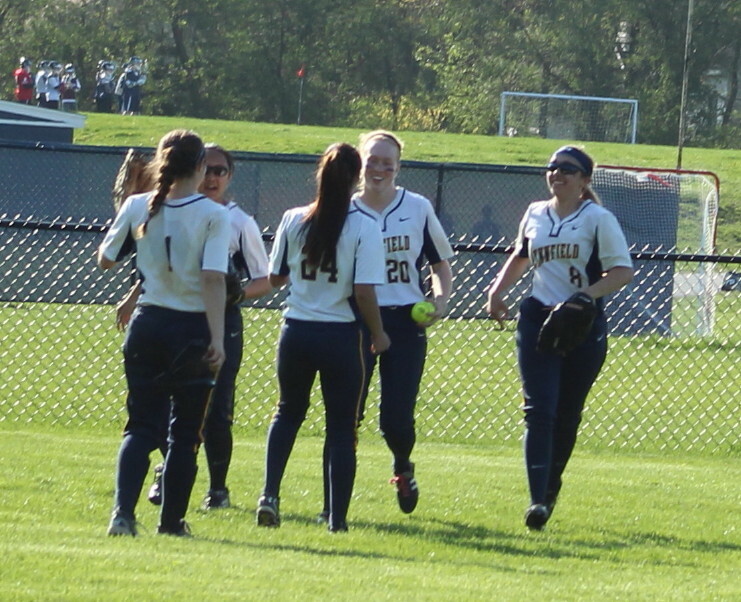 Tara Kelleher followed with a grounder that got between AHS first baseman Zoe Fitzgerald and second baseman Lauren Fedorchak allowing Breanna Richard to hustle home with the second NDA run. 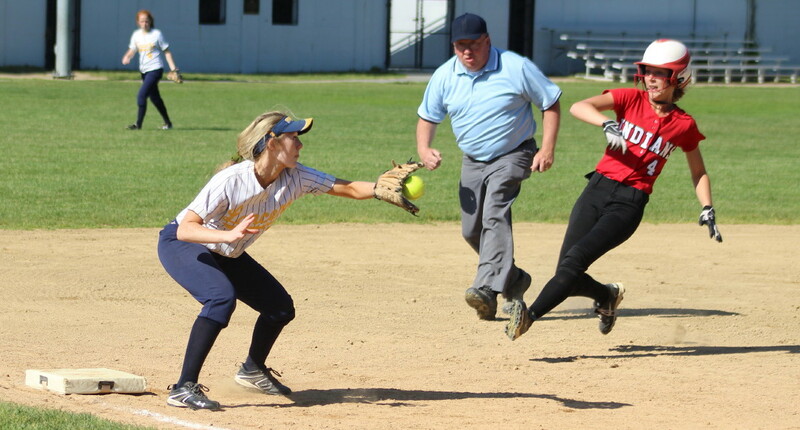 Amesbury gained separation in their half of the fourth inning. The Indians put seven hits together to collect six runs in an inning extended by a 2-out drop by centerfielder Mary Grace Handy. 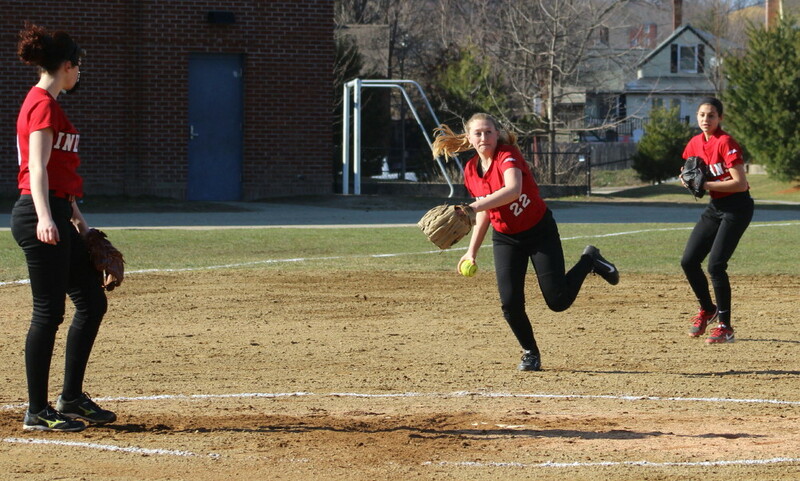 Amesbury sent ten batters to the plate. In the sixth inning the Indians added three runs. 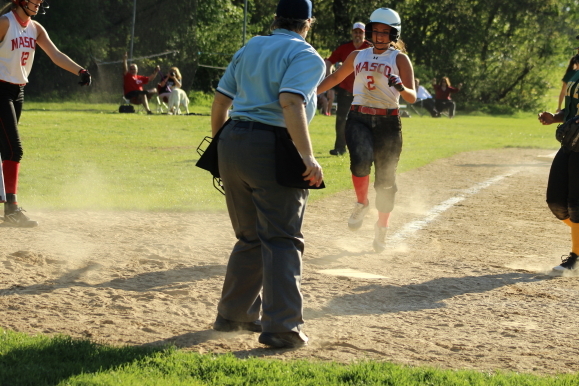 Rachel Cyr had her third RBI and teammate Alexis Boswell scored her third run of the game. 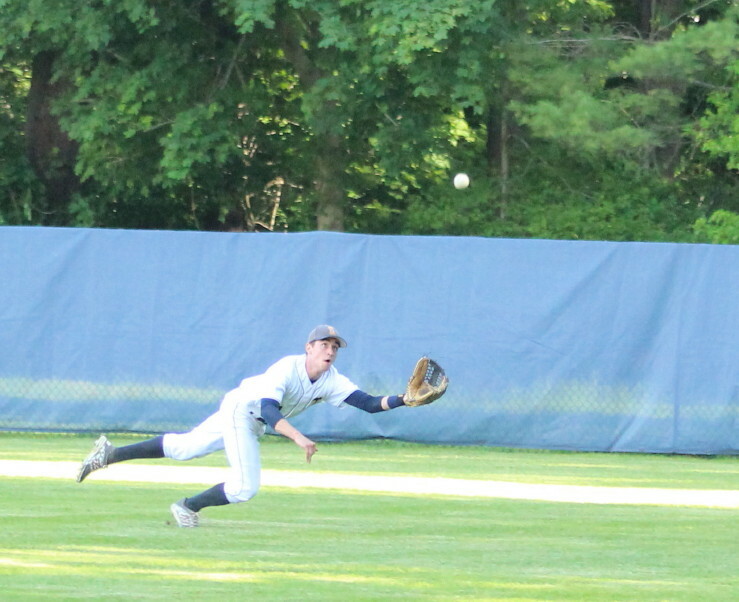 This inning was also extended for Amesbury by another drop in centerfield. 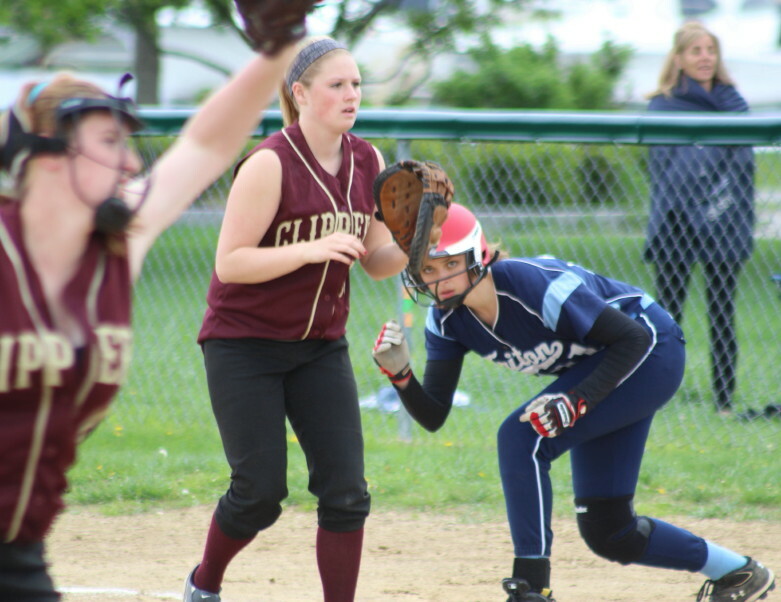 Clare Handy paced NDA with two hits. 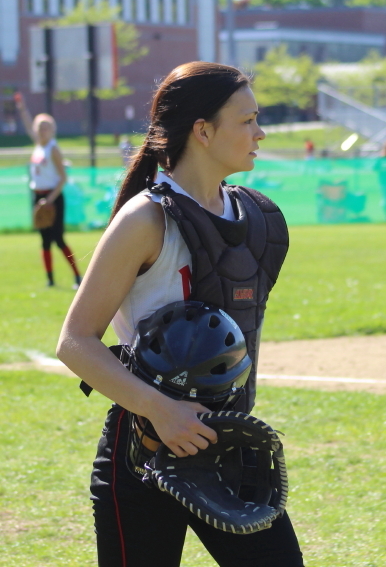 For Amesbury, Rachel Cyr had four hits while Alexis Boswell had three hits. Alexis also had two RBI. 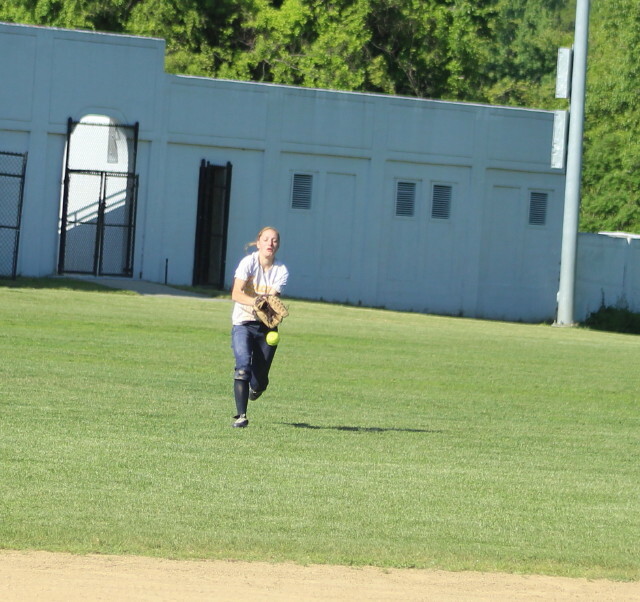 NDA rightfielder Loren Sullivan made a nice running catch in the third inning. Alexis Boswell chased Regan Szekely’s double into some Wrigley Field vegetation in foul territory in the NDA fourth inning. 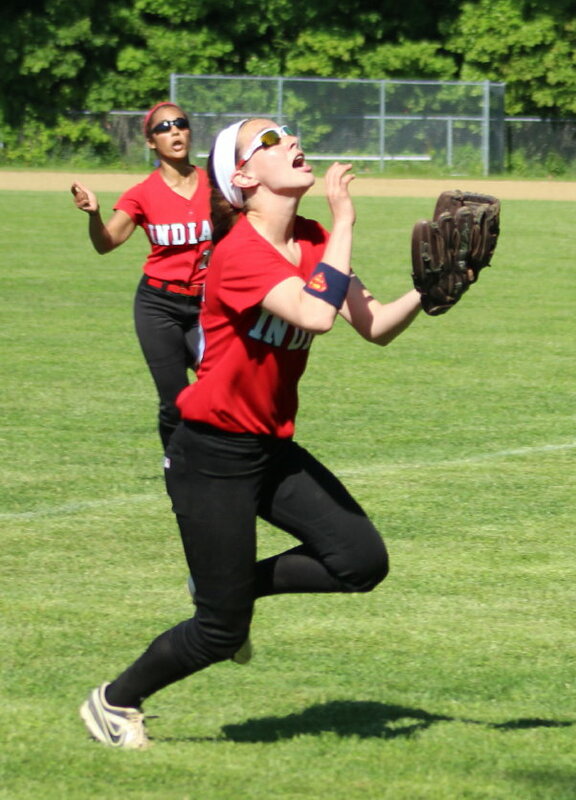 Second baseman Lauren Fedorchak made a terrific running catch in foul territory of a popup in the third inning. Meg Aponas and Amanda Schell hit long foul balls to left. Last home game for Rachel Cyr, Alexis Boswell, Lucy Scholz, and Amanda Schell. NDA was 13-7 last season. 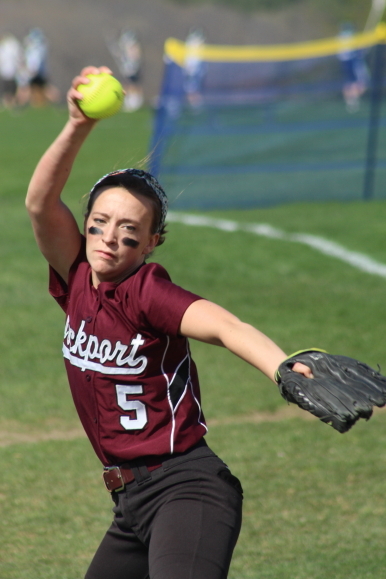 The Lancers had two close games with Rockport this season. Amesbury and St. Mary’s of Lynn are just a win away from facing each other in the D3 North finals. 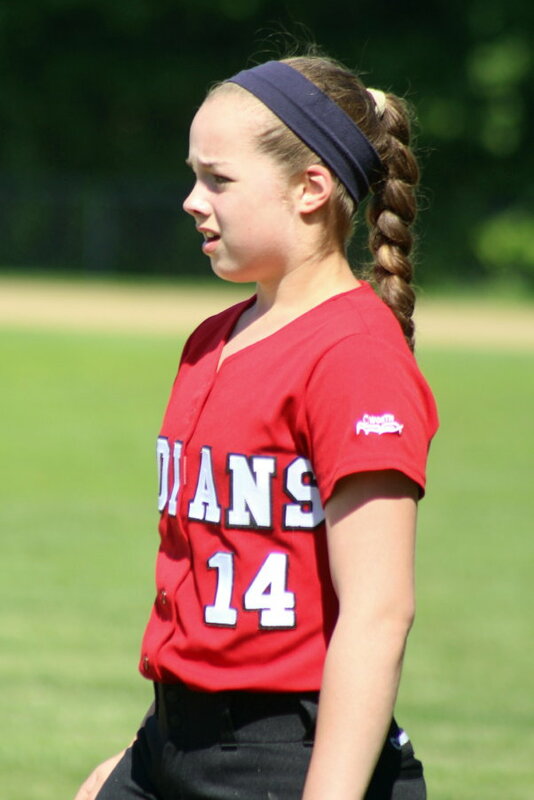 The Spartans defeated the Indians 4-1 in a game this season at Amesbury. 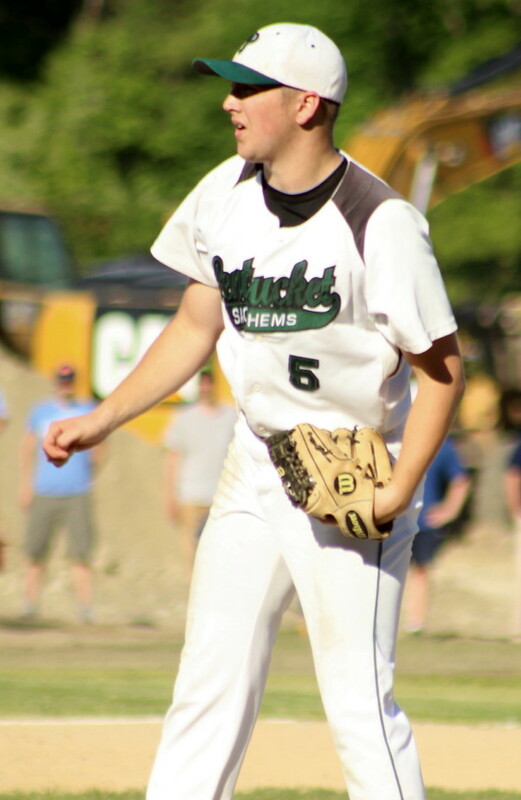 (Lynnfield MA) Ryan Kuchar pitched a complete game, 2-hitter as Pentucket defeated Lynnfield, 3-1, in the Division 3 North quarterfinals on Monday afternoon at sunny Lynnfield. The Sachems (15-8) now move to the semifinals on Wednesday afternoon (4PM) at Fraser Field (Lynn) against another Cape Ann League opponent, Hamilton-Wenham. 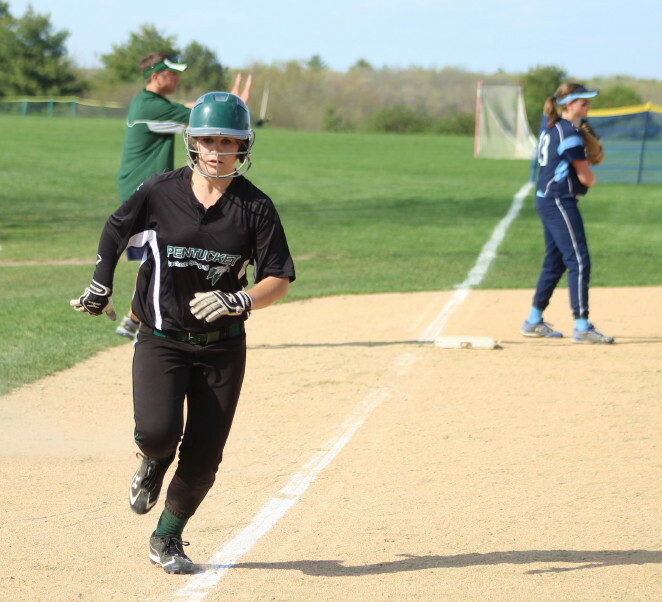 Pentucket and HW split 2-1 games during the regular season. Both Lynnfield hits (Greg Basilesco and Nick Pascucci) were in the third inning when the Pioneers (15-7) picked up their run. 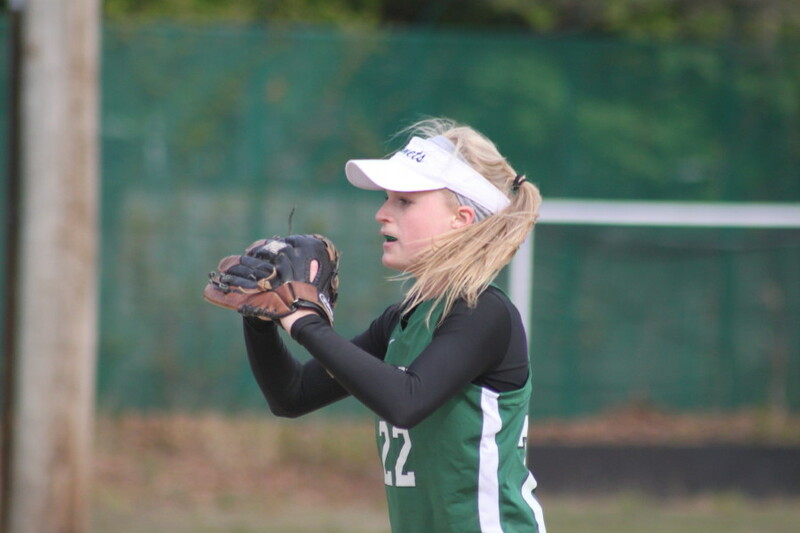 Pentucket ended up with seven hits and had runners in scoring position in the first, second, and fourth innings but Lynnfield pitcher Dave Johnson escaped each time. 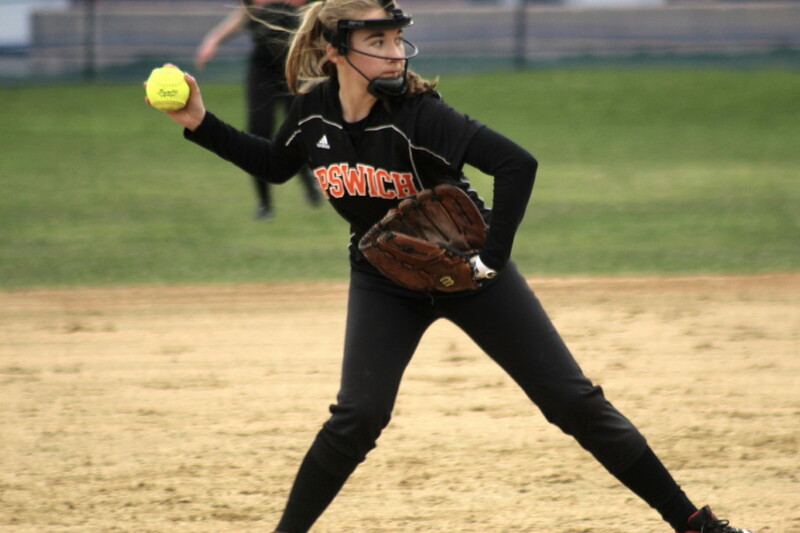 The escaping ended in the 5th and 6th innings as the Sachems collected two tarnished runs in one inning and an untarnished insurance run in the other inning. 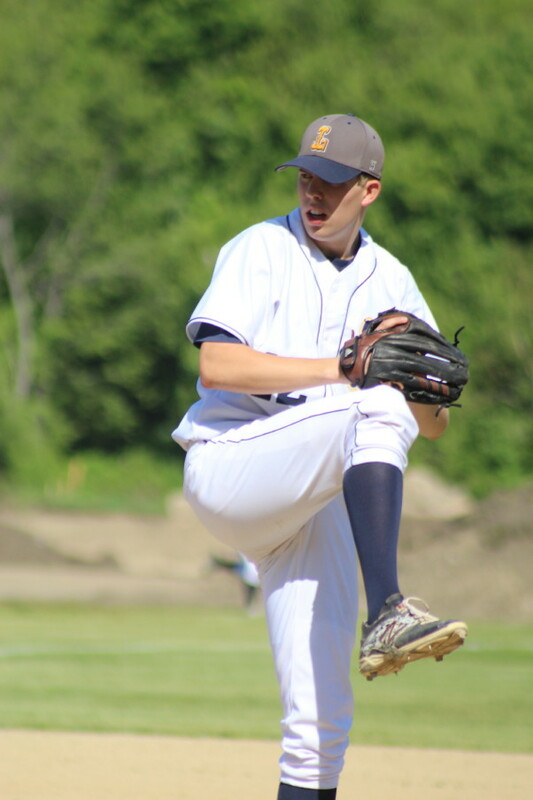 Ryan Kuchar was the big story as he kept Lynnfield from getting anything going on offense except in the third inning. 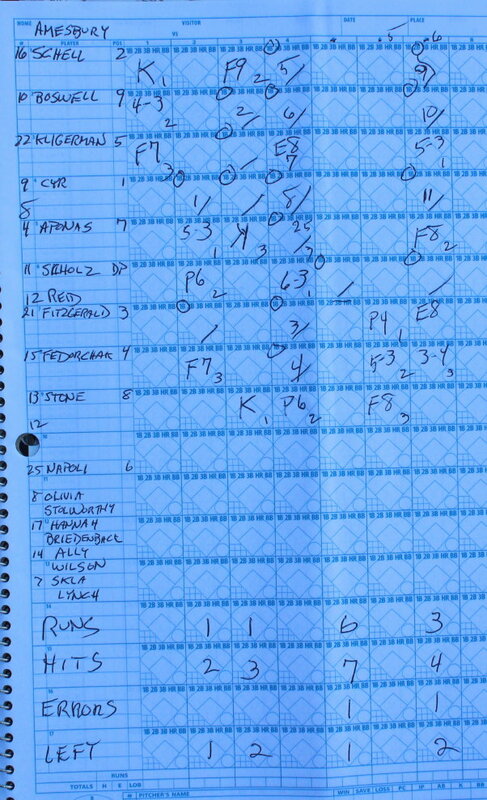 In that third inning, Greg Basilesco singled to right and reached third base after two straight fielders’ choices. 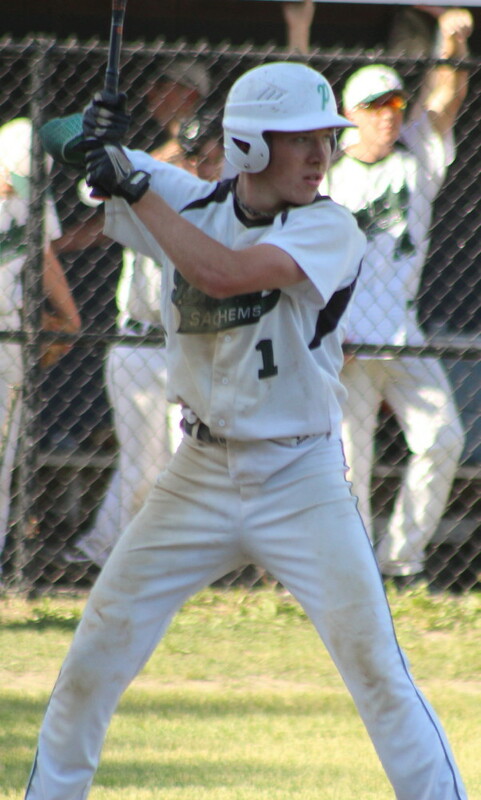 Nick Pascucci’s bloop single to short center earned him the RBI. Down 1-0, Pentucket had a great chance in the fourth inning. John Sirois’ single was followed by a Greg Basilesco (3B) error on a grounder. A fielder’s choice moved the runners to second and third with one out. But pitcher Dave Johnson retired Bobby Hallowell and Kiernan Haley and the Pioneers still had their 1-0 lead. The top of the fifth turned out to be the game-decider. Pat Beaton led off with a double to left. It is not usually a good idea to try for third when a grounder is hit to the shortstop………but Pat tried it and got away with it because third baseman Greg Basilesco dropped the throw from shortstop Jordan Roper. 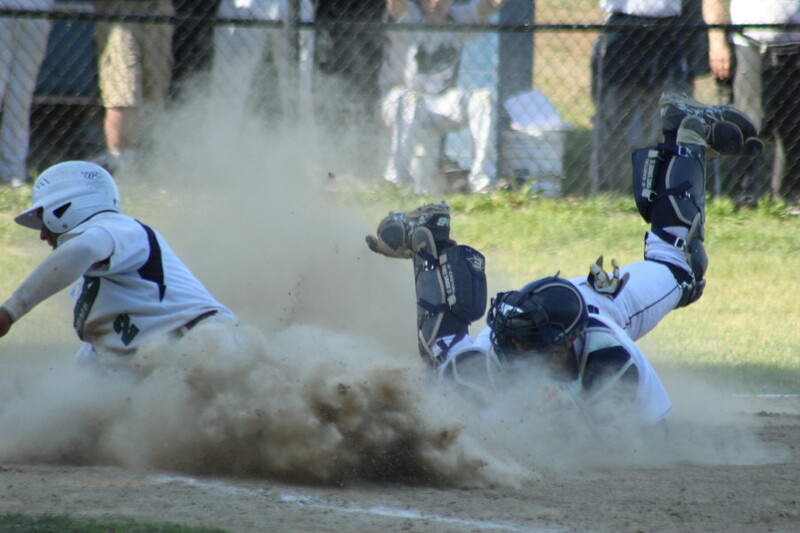 Lynnfield then tried to turn two on DJ Englke’s grounder to third but could only get the force at second. Pat Beaton scored on the play to tie the game. Still only one out. Ryan Kuchar singled getting DJ to second. 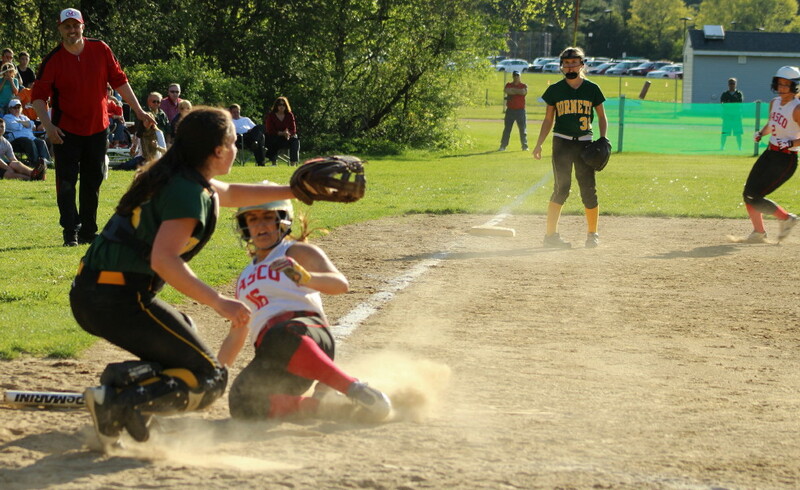 The Sachems then pulled a double steal on a pitch in the dirt that catcher Traverse Briana had no chance to do anything with. 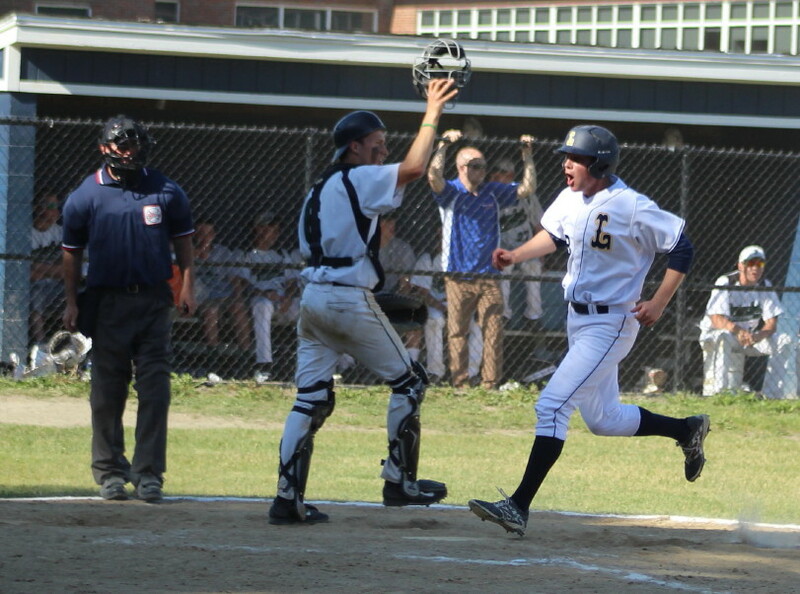 The next play will be a bad memory for the Lynnfield faithful for a long time. John Sirois hit a grounder to short with two outs. From where I was standing, shortstop Jordan Roper didn’t handle the ball cleanly, and then threw high to first. 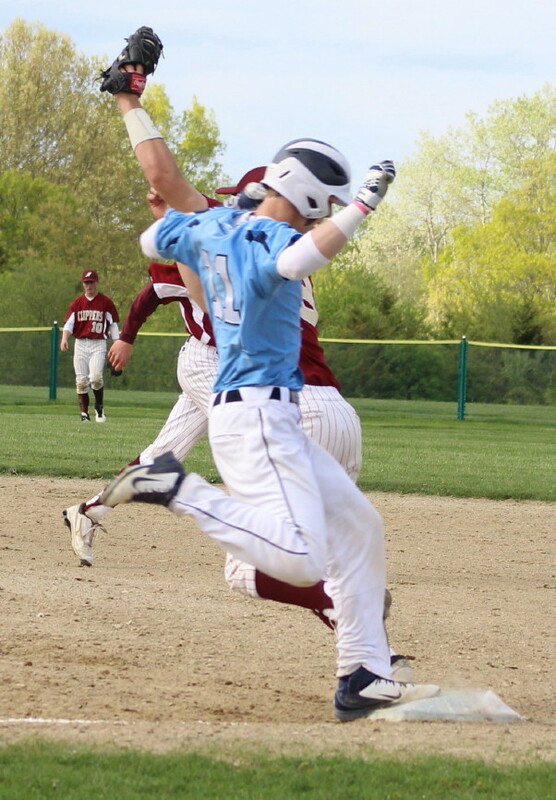 It looked as if first baseman Spencer Balian came off the base reaching up for the throw and that was why John Sirois was safe. Not so according to the infield umpire. I heard him tell LHS coach John O’Brien that the runner had beaten the throw anyhow. The play was huge because if John is out the inning is over. If he’s safe, which was the ruling, the Sachems have a second run. Nothing controversial about the Sachems third run. Bobby Hallowell tripled to right in the sixth inning and was driven home by Pat Beaton’s two-out bouncer up the middle. 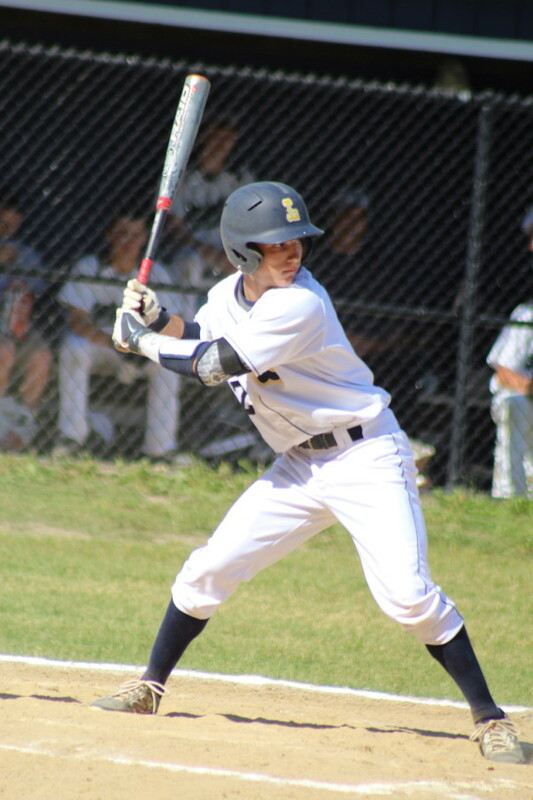 Lynnfield had some two-out excitement in the seventh when Spencer Balian reached on a bad-bounce error by third baseman Bobby Barry. Greg Basilesco next hit a grounder at shortstop Pat Beaton that also took a bad bounce but the PHS shortstop reacted quickly and got an assist on the final out of the game. Weather? When you can have sun, a little breeze, and no bugs you can’t ask for much more. Good setting at Lynnfield to watch a game. They have a gradual hill behind the backstop. 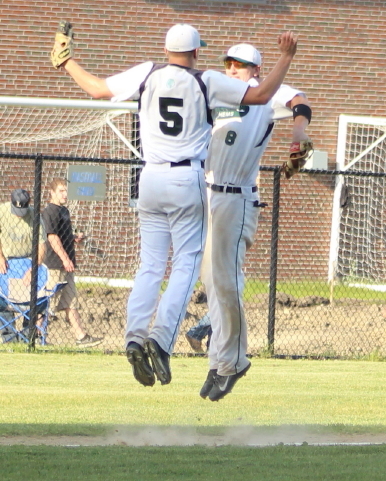 Pentucket made an unsuccessful attempt at a suicide squeeze in the fifth inning. 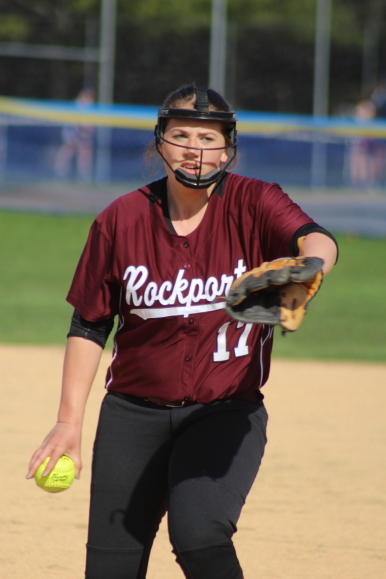 Ryan Kuchar pitched a no-hitter a month ago against Rockport. Many of my pictures have construction vehicles in the background. A number of new playing fields are getting constructed. North Reading coach Frank Carey was part of the crowd. His Hornets are still alive in D3 North. 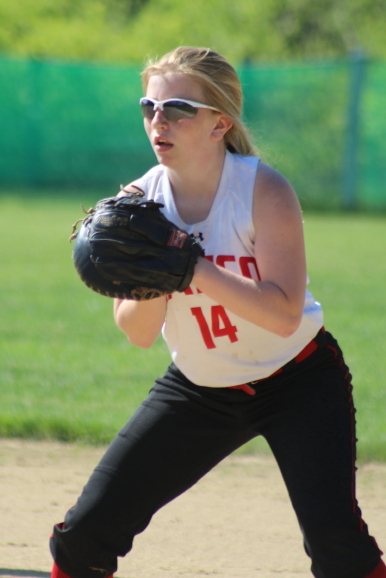 (Topsfield MA) For 2 1/2 innings Masconomet looked like anything but a softball team on a twelve game winning streak. The rest of the way? 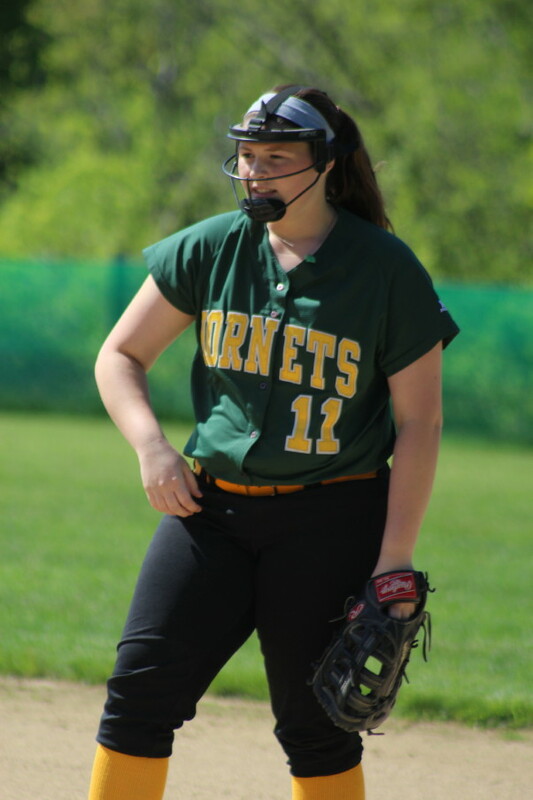 The Division 1 Chieftains (17-2) overcame a five-run deficit and overtook Division 2 North Reading, 7-6, with two runs in the bottom of the seventh inning on a sunny Wednesday afternoon. 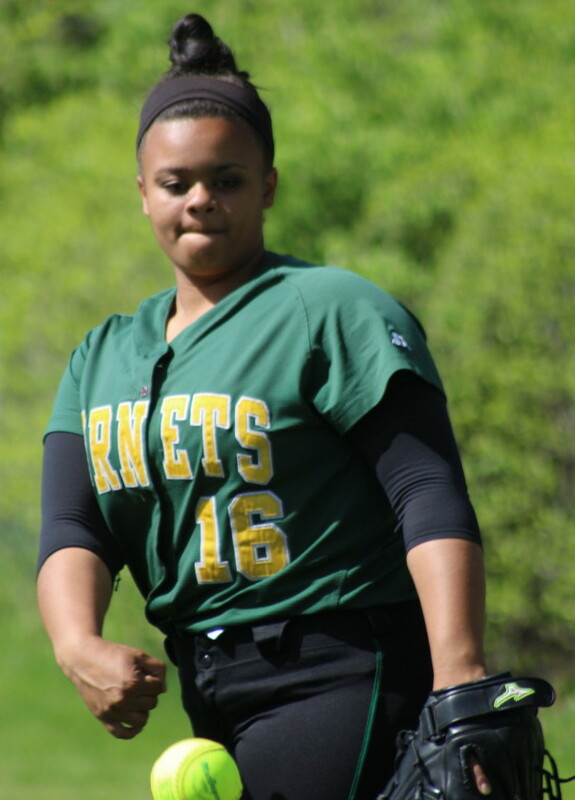 The Hornets (14-5) carried a 6-5 lead into the top of the seventh inning and were in an excellent position to pad their lead as they loaded the bases with one out. 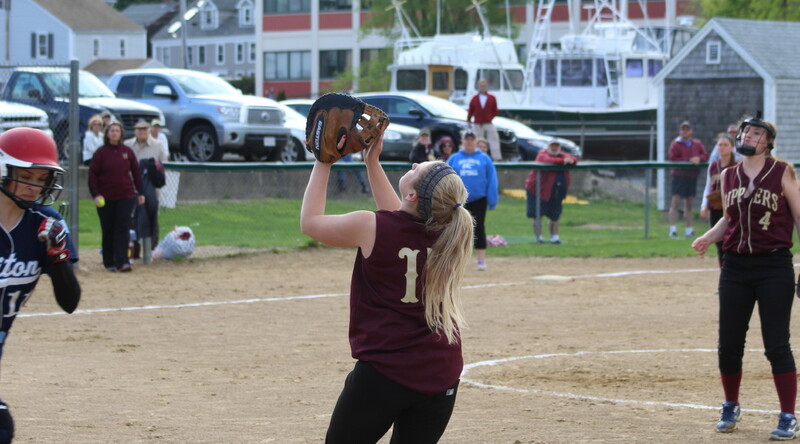 But Masco’s complete game winner, Emily Dow, struck out Emma Santosuosso and got Bryanne Riley to fly out keeping NR off the scoreboard. 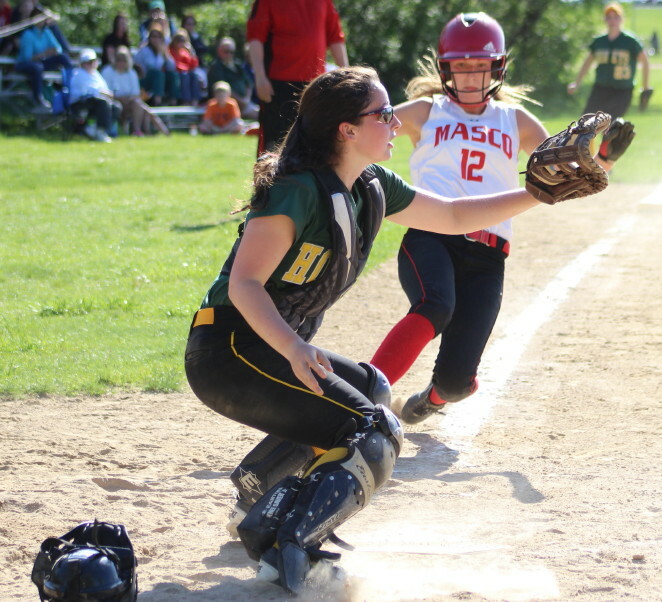 Now Masco needed a run to tie and another run to win. They got both. Emily Dow hit a two-strike single on the ground up the middle. Tayla Murray ran for her. Jordyn doubled sending her sister to third with one out. 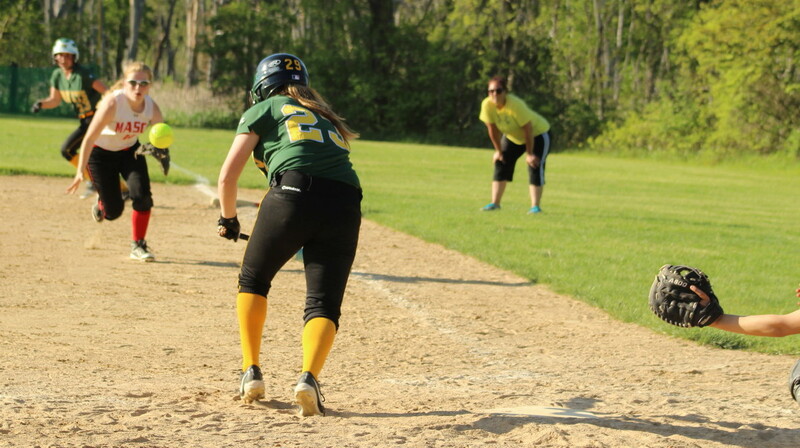 Second baseman Carly Swartz opted to come home with Kylie Currier’s grounder but Tayla Murray slid home safely to tie the score. 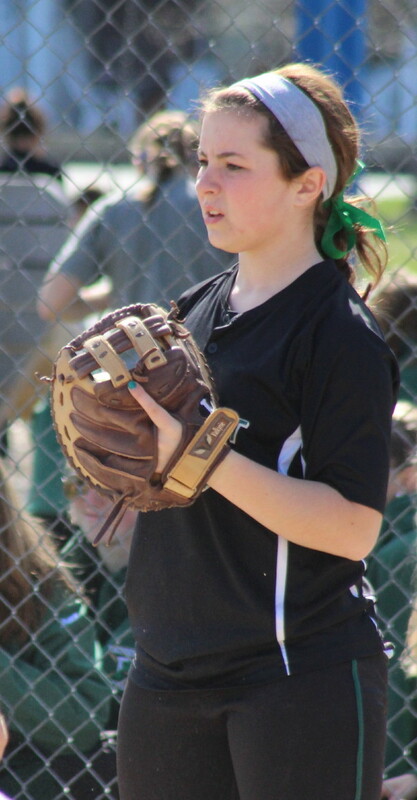 Her sister (Jordyn) reached third on the play. A fly to center wasn’t deep enough so Jordan held at third with two out. Jordyn did get home standing up on a Kendra Butner pitch in the dirt, that eluded NR catcher Sophia Warner, to give the Chieftains the win. 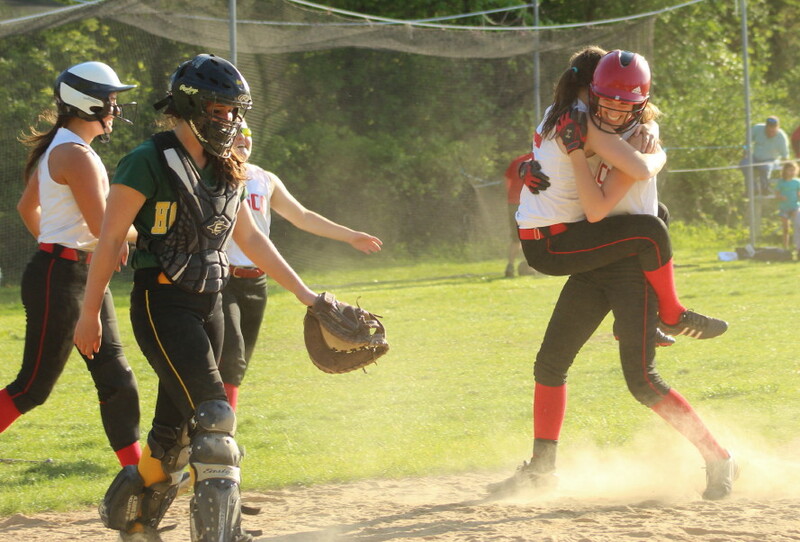 The victory gives Masco the Cape Ann League Kinney Division title. I came away impressed with the Chieftains’ hitting. They collected thirteen hits and everyone in the lineup had at least one of those hits. 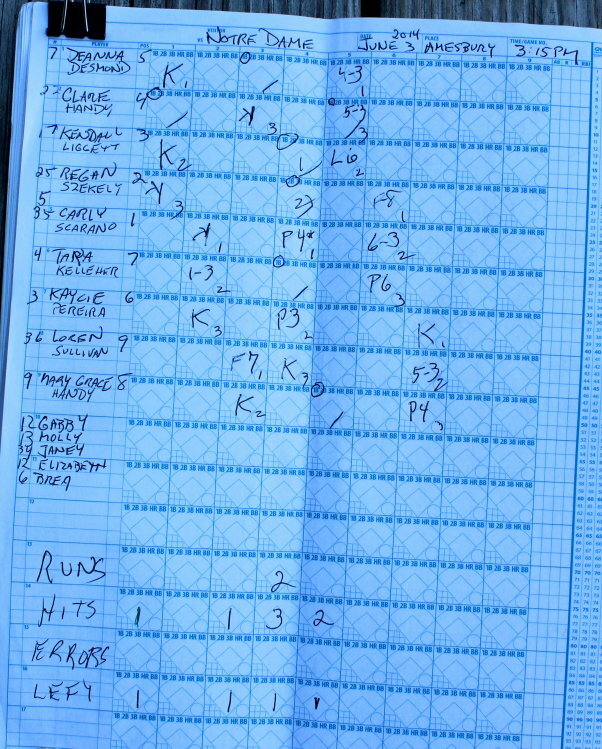 Eight of the hits came in the final three innings. Junior Sophia Warren was a perfect four-for-four. 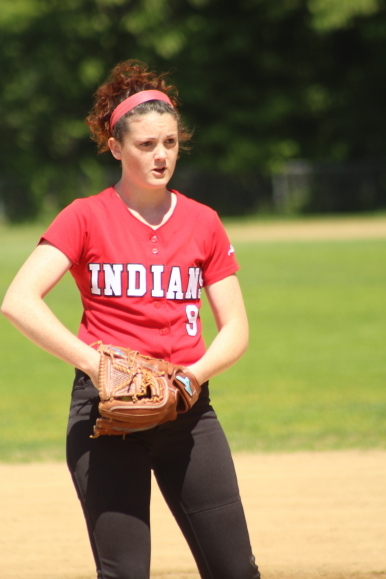 She also scored a run and had an RBI for North Reading. Kendra Butner launched a no-doubter over the fence in left in the NR fourth. 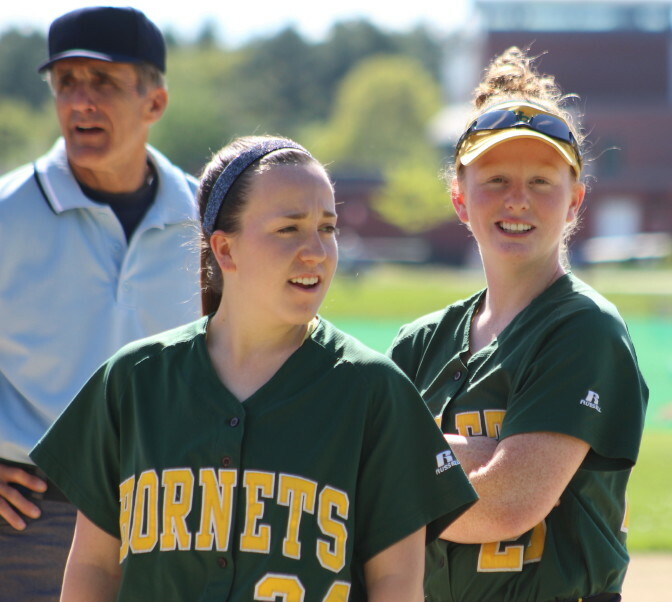 The Hornets did get five runs in the first three innings but they also stranded five runners. Once the Masco bats came to life those stranded NR runners became very important. 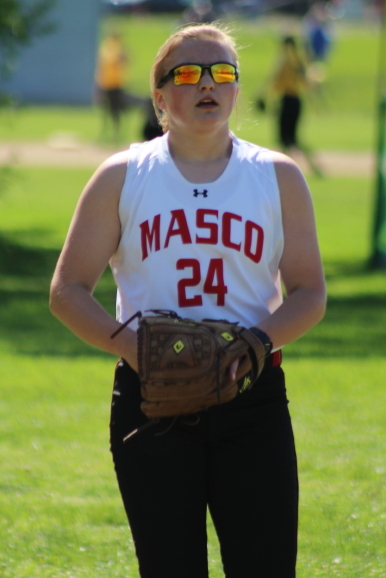 Julianna Kostas paced Masco with two RBI. 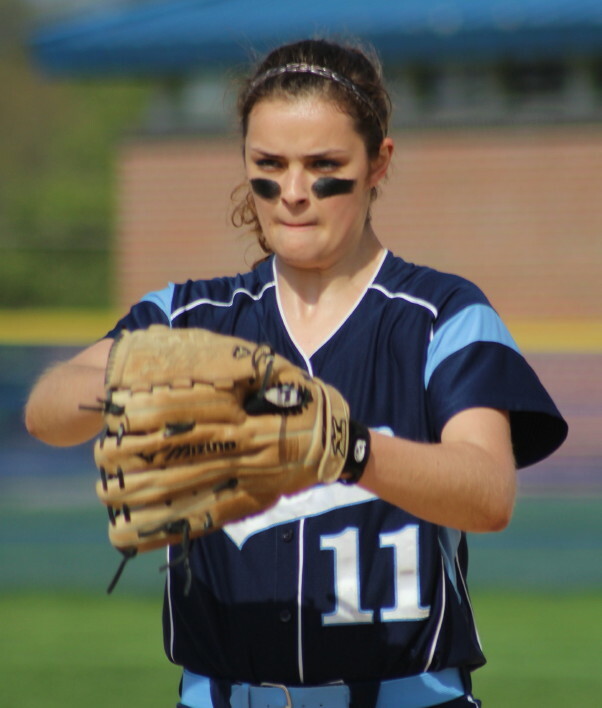 Maddie Kelly, Alex Mendelsohn, Emily Dow, and Kylie Currier had one RBI apiece. 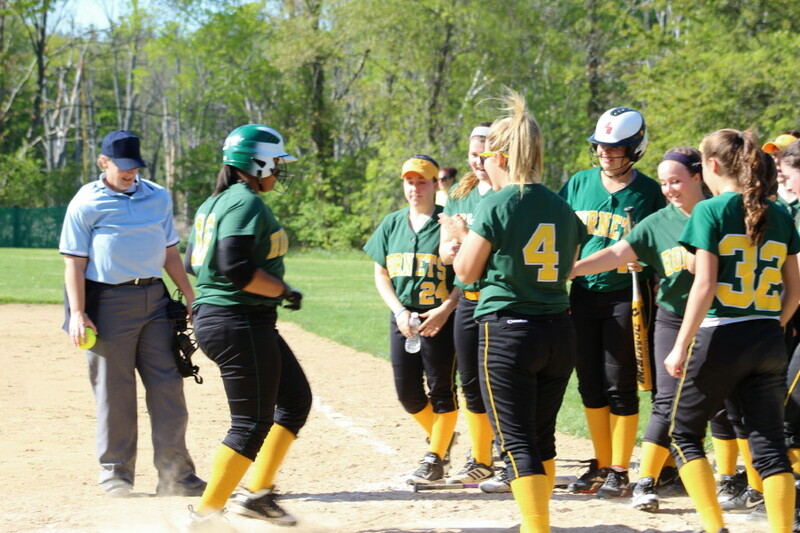 Cassidy Gaetta, Tarah Reilly, Sophia Warren, and Kendra Butner had the RBI for North Reading. 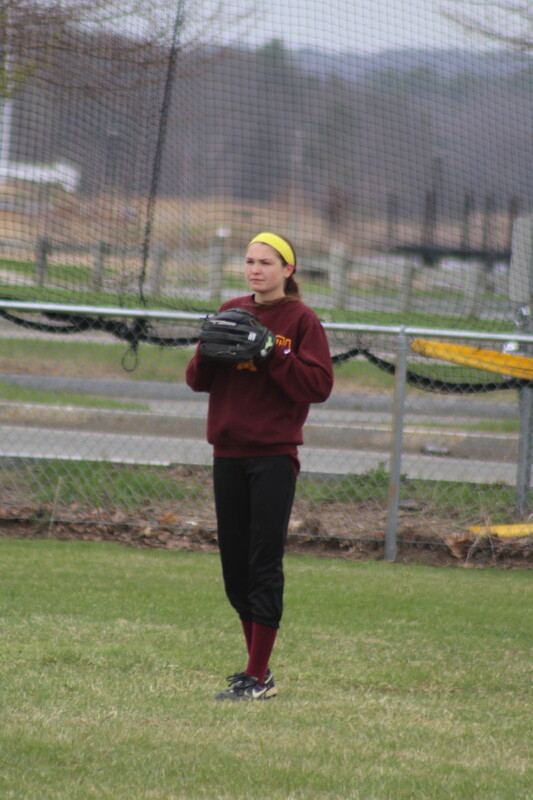 Errors by shortstop Casey Maidment (fielding) and rightfielder Jordyn Murray (throwing) gave NR two unearned runs in the first inning. 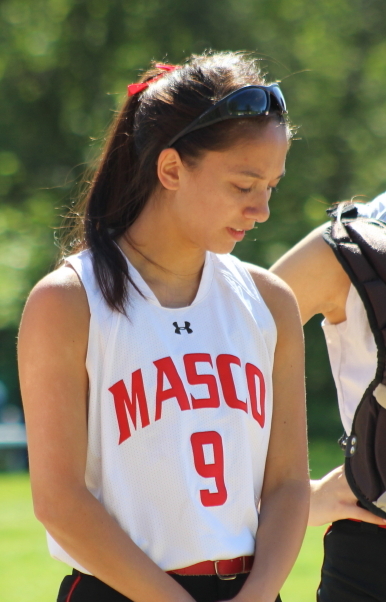 The last Masco loss? 6-5 in nine innings at North Reading. 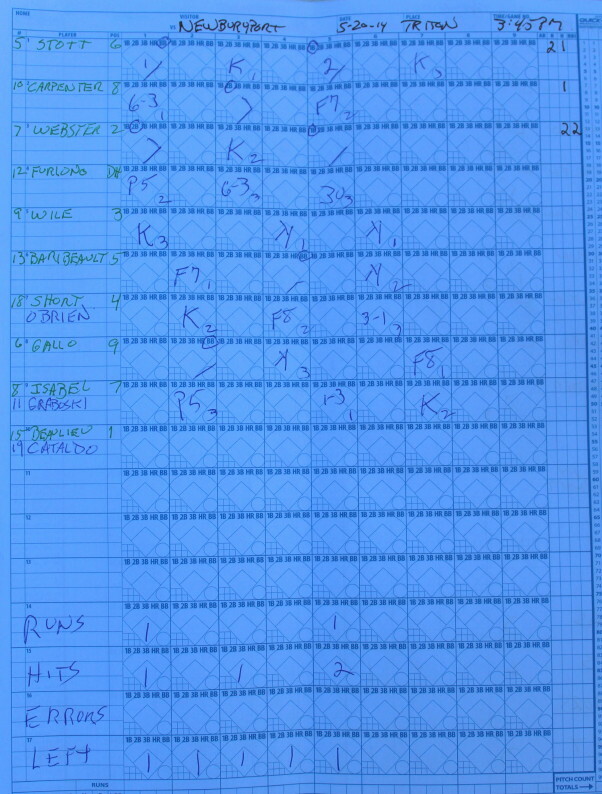 The Hornets scored two runs in the bottom of the seventh inning to send that April game into extra innings. The other Masco loss? 4-1 to Newburyport in the season opener. A young Masco fan was hit by a hot grounder. Two North Reading players were quick to bring ice packs. Somewhere they learned that there is more to life than softball. 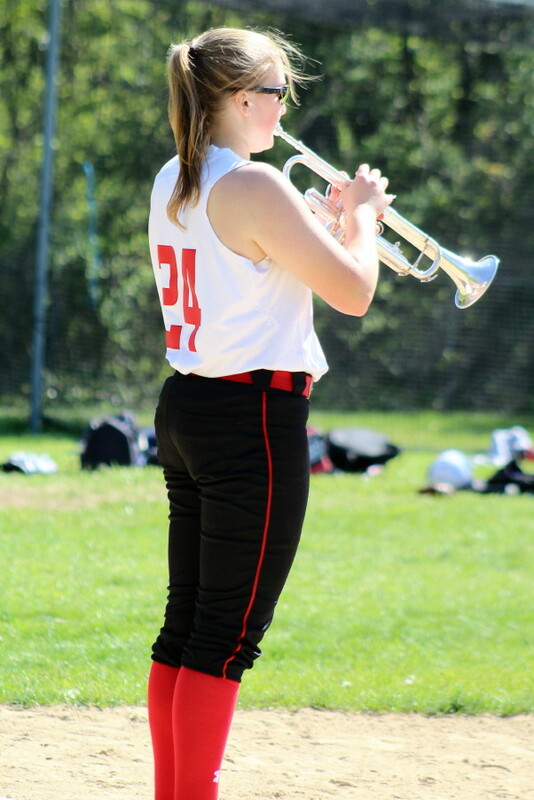 Emily Dow played the National Anthem with her trumpet. 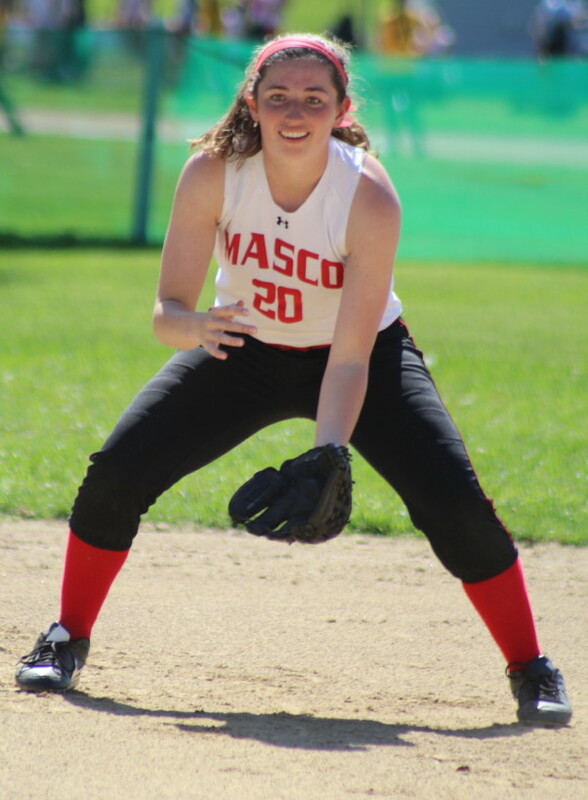 A key to the Masco win was limiting 2013 CAL All-League Tarah Reilly to just one hit. 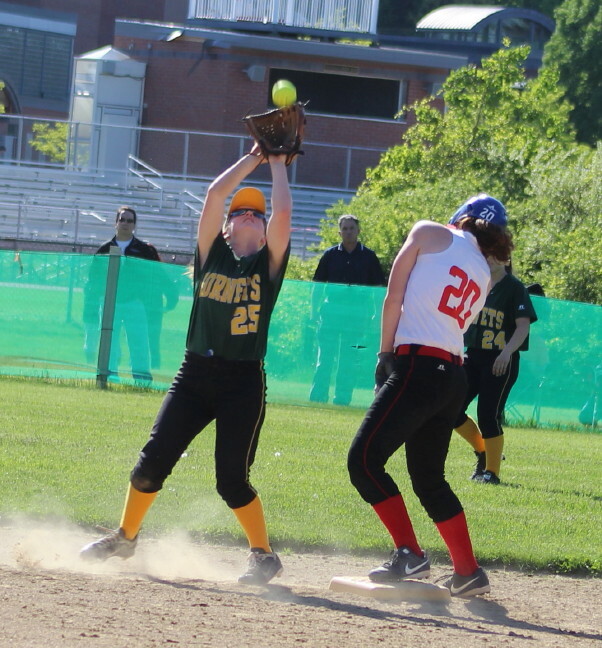 As shortstop, Tarah made a sure-handed play to end the sixth inning preserving NR’s one-run lead. 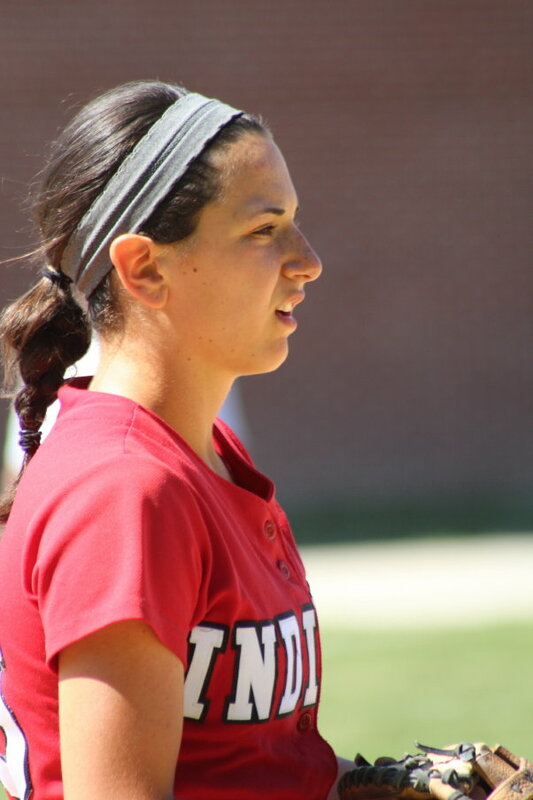 Maddie Kelly (2013 CAL All-Star) had a double, triple and scored a run. Weather? Perfect with plenty of sunshine. Kendra Butner reaches home after a shot over the fence in left. 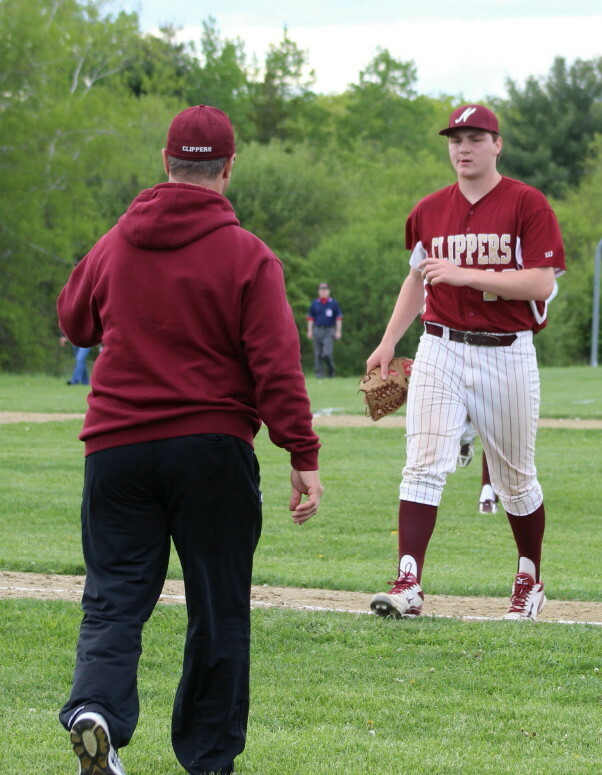 (Byfield MA) It was not as if the Newburyport Clippers weren’t in familiar territory. 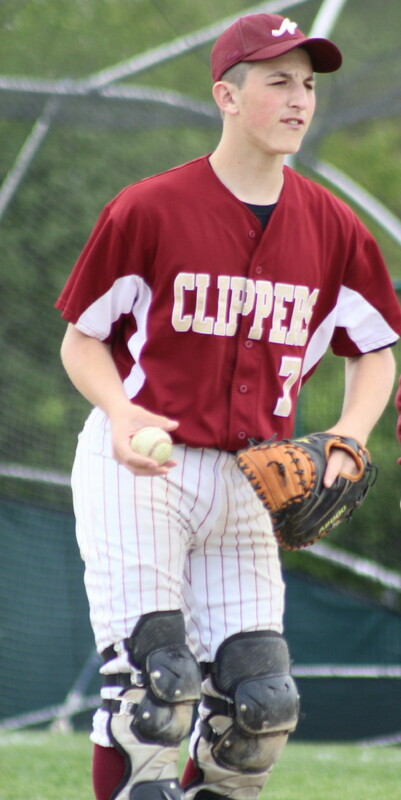 For the ninth time this season the Clippers found themselves in a one-run game and this time it went their way, 2-1, over Triton on a cloudy/sunny Tuesday afternoon of Cape Ann League baseball. 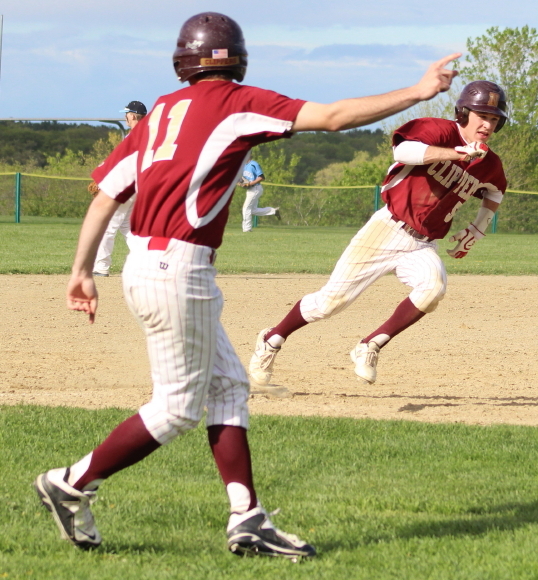 Newburyport (7-11) is now 5-4 in one-run games. 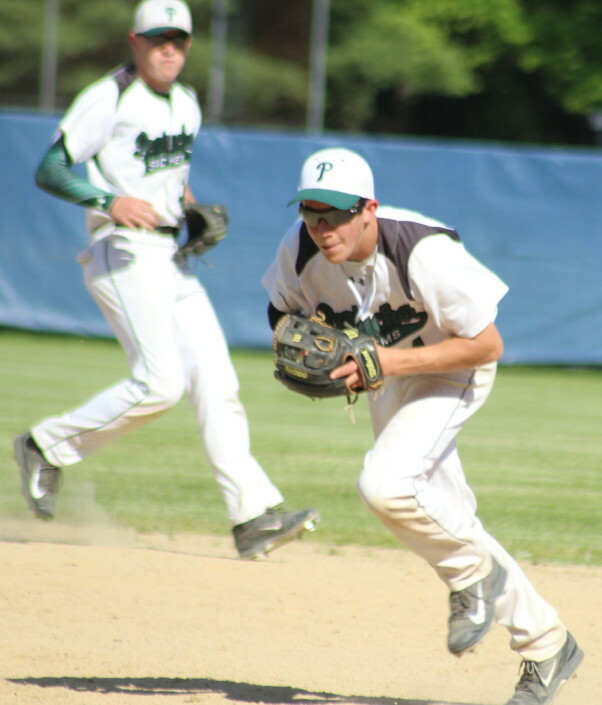 The loss pushes Triton (7-10) to the brink of elimination from post-season play. 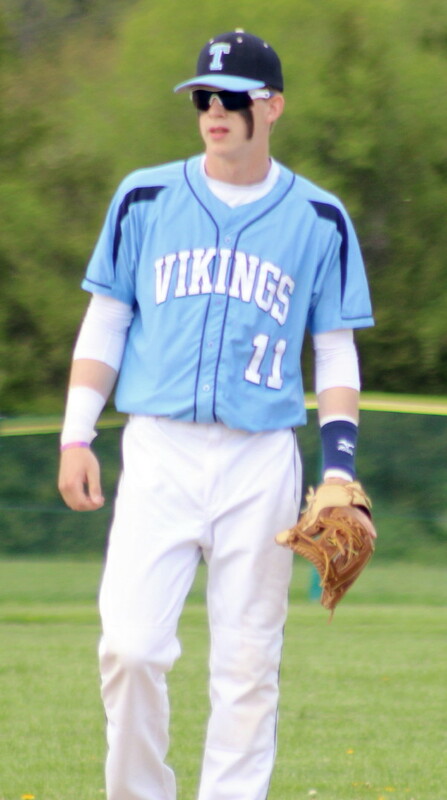 The Vikings must win their final three games starting with North Reading on Thursday. Caleb Stott and Scott Webster combined (twice) to give the Clippers the runs they needed. Caleb reached base in the first and third innings, stole second both times, and scored both times on singles by Scott. 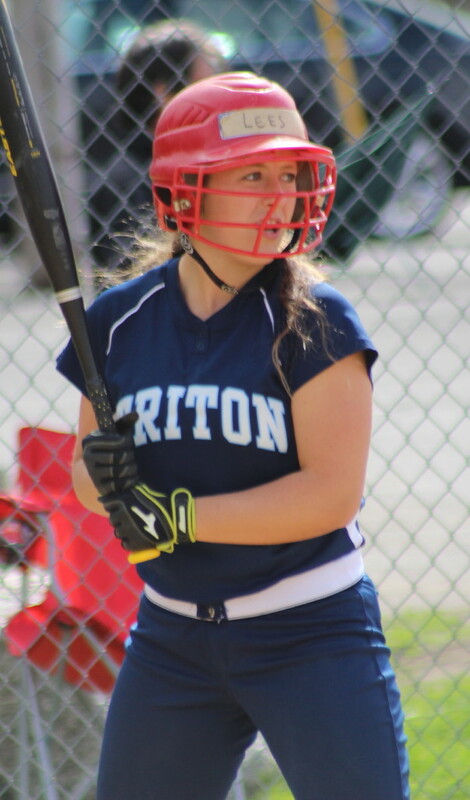 Triton had the makings of big innings in place in the second and sixth innings when they loaded the bases in each inning with one out. The Vikings only came away with one run. NHS starter Cam Beaulieu struck out Michael Talbot and Brad Whitman to end the second. In the sixth, reliever Will Cataldo K’d Jack Germinara and got a ground out from Michael Talbot to keep Triton from getting any runs in that inning. 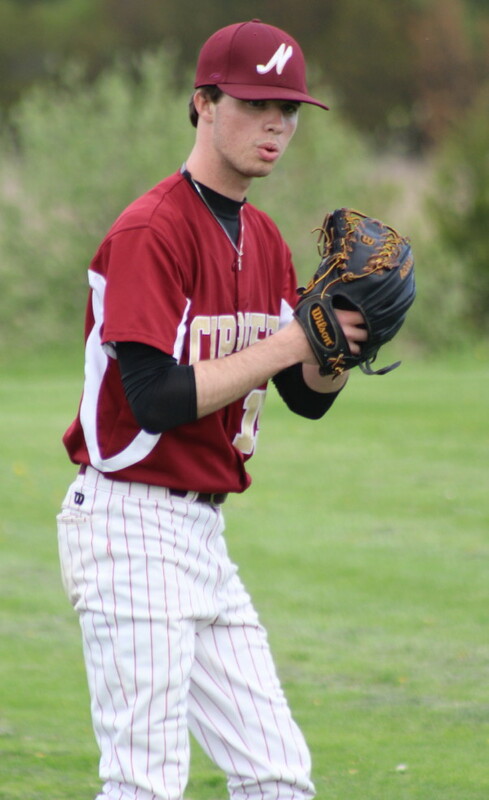 Junior Adam Chatterton (4-3) certainly deserved a better fate for his complete-game effort. 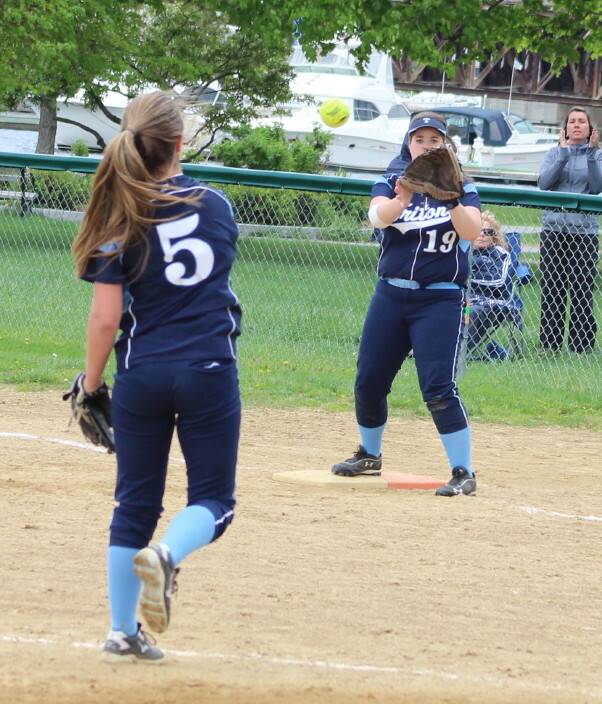 The Triton righty allowed only four hits to go along with ten strikeouts. 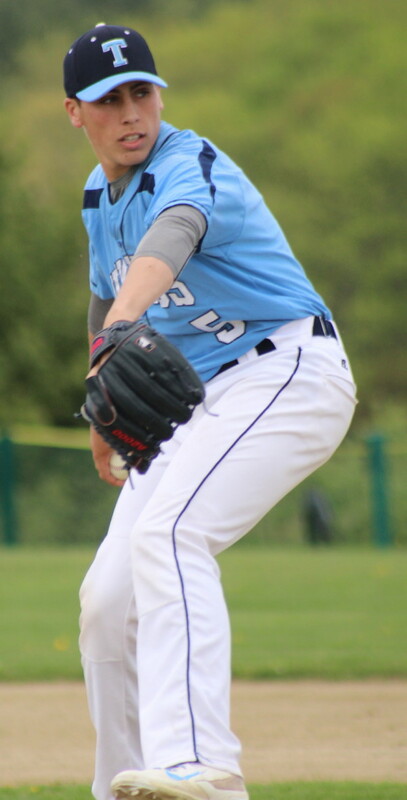 Adam was the winning pitcher in Triton’s 4-1 victory over Newburyport in April. Adam and Billy Mical paced the Vikings with two hits apiece. 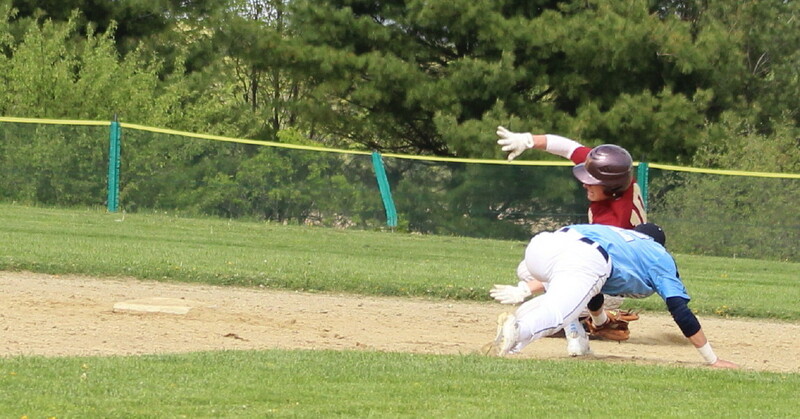 Second baseman Matt Short was on the tagging end of Nick Desrocher’s steal attempt in the first inning and came up limping. 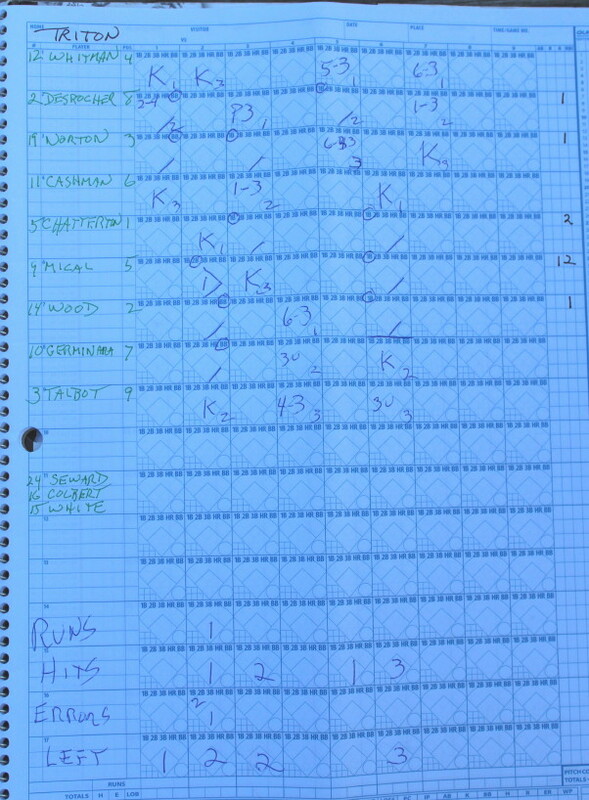 Other than Scott Webster’s throwing error in the second inning, the Clippers were flawless in the field. Chance Carpenter looked like a dead duck when he tried to stretch a single into a double but somehow found a way to get around Brad Whitman’s tag at second. Chance then stole third with one out but Adam Chatterton retired Scott Webster and Ryan Furlong to end the threat. 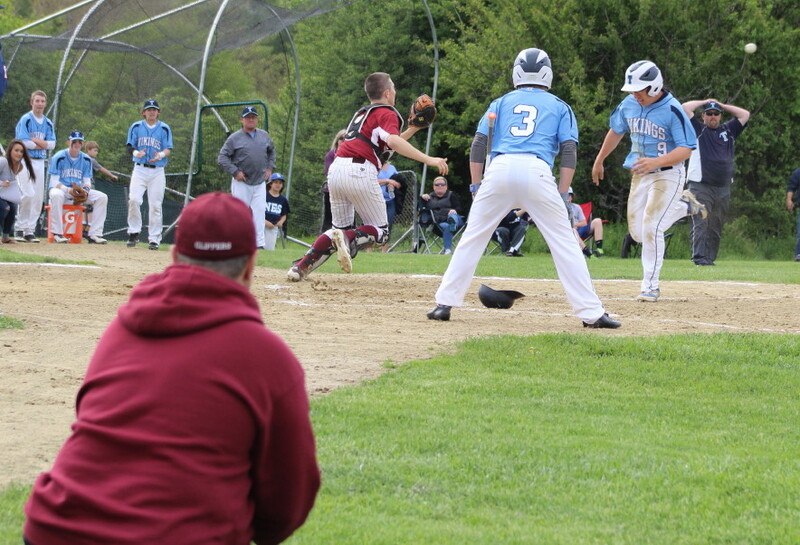 On Caleb Stott’s single in the fifth inning (that led to Newburyport’s second run) third baseman Billy Mical was in on the grass guarding against a bunt. Billy never had a chance at Caleb’s liner down the line. 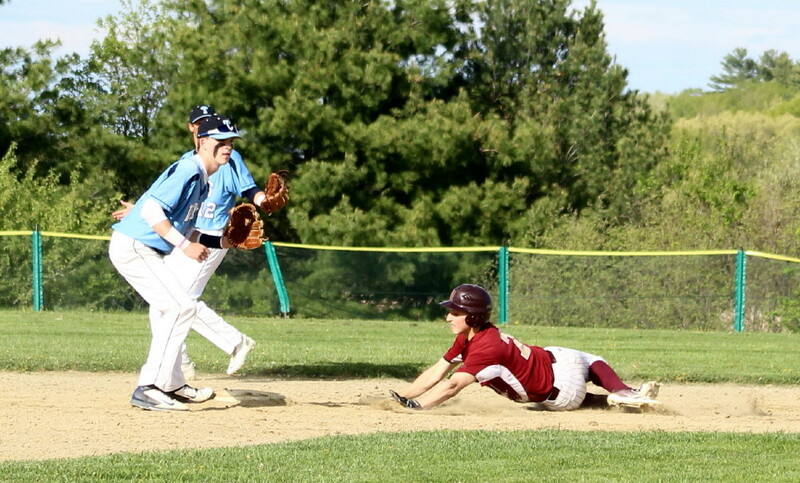 Shortstop Caleb Stott was part of Newburyport’s 6-3 double-play that ended the fifth inning. Junior Will Cataldo set the last five Triton batters down in order to get the save. Newburyport will host Pentucket on Saturday. 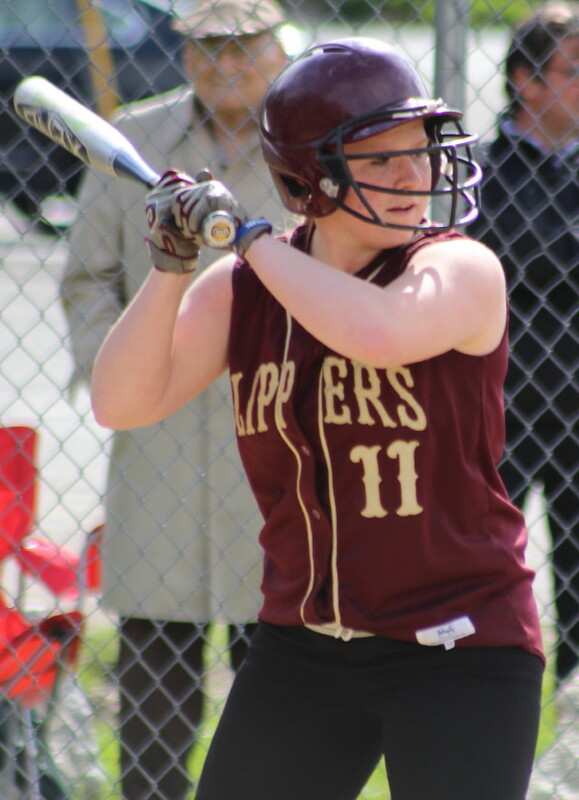 (Newburyport MA) Shelby O’Brien’s three-run homer was the big hit for Newburyport in their, 5-2, win over Triton on Monday afternoon. A huge win for the Clippers (9-8) as they try to qualify for the post-season. They now need one win in their three remaining games to get it done. The loss ended a three-game slide for the home team. Their next game is at Pentucket on Wednesday. 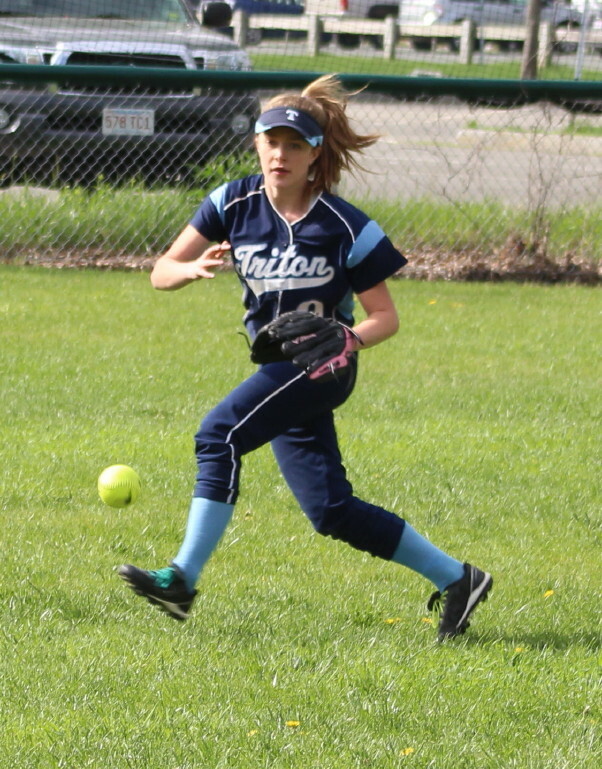 Triton (5-13) had a five game win-streak in mid-season but have struggled in the games before and after that run of good softball. The Vikings were missing four starters (Rylee Culverwell, Casey Ross, Christine Ciccone, Julia Hartman) for today’s game. That put inexperienced players into unfamiliar places. 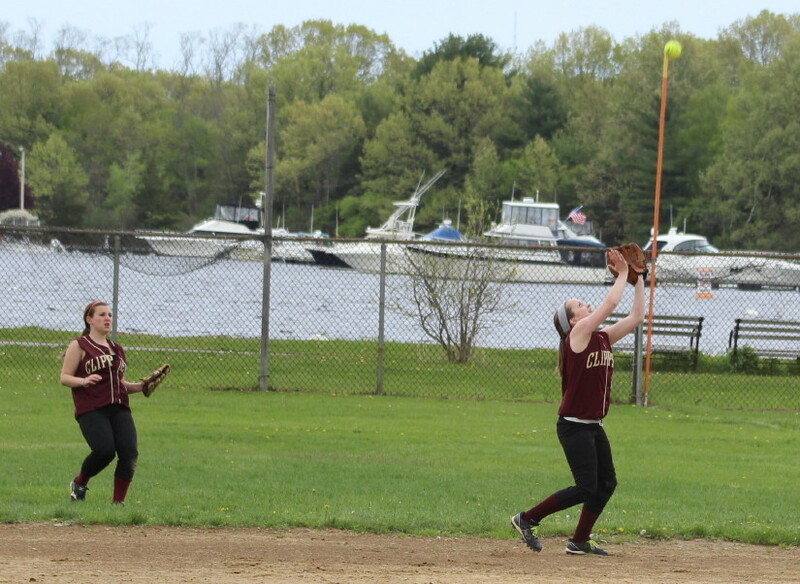 Newburyport scored three in the first inning and two in the third inning. Triton got its runs in the first two innings. 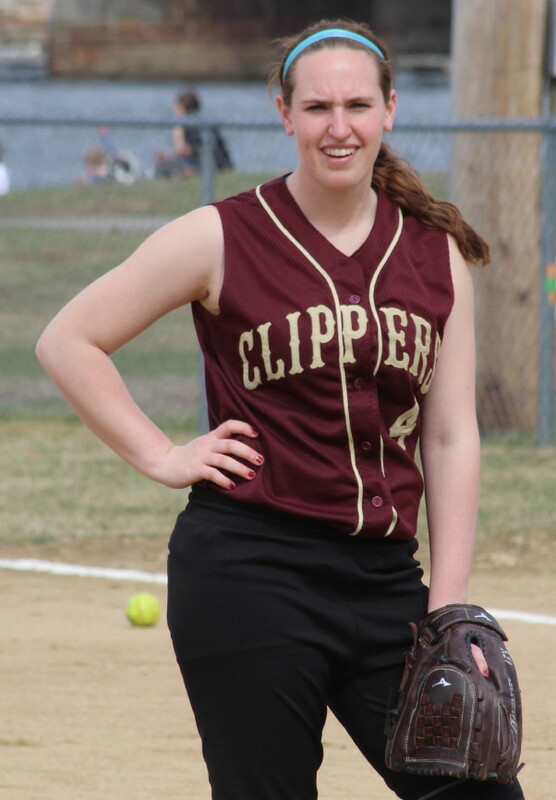 Senior Vicki Allman pitched a 5-hitter for the Clippers with no walks. 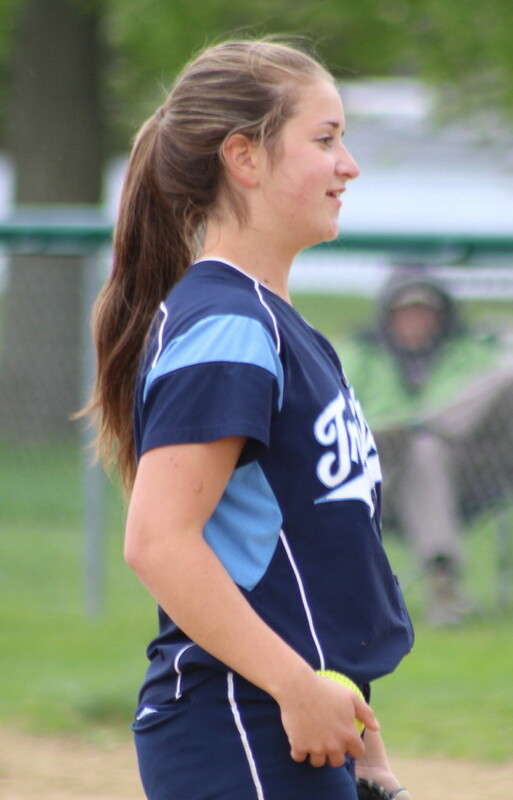 After the first two innings, only one Viking (Emma McGonagle) was able to get to second base over the final five innings. Vicki was hit hard in the first inning in more ways than one. Mara Spears led off with a triple to left center. 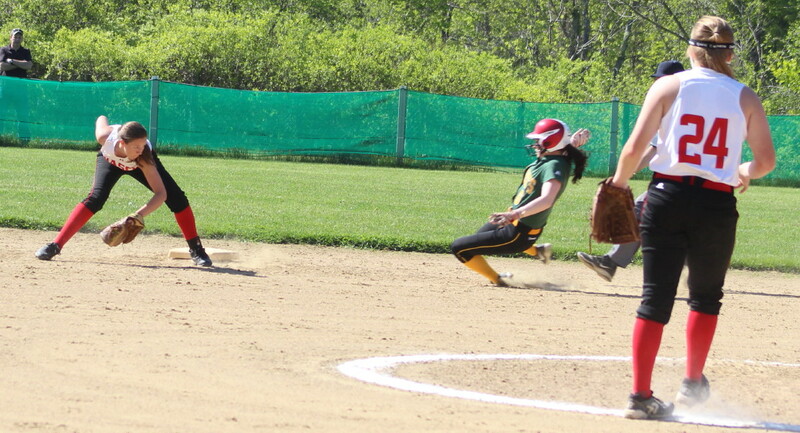 Third batter (Kylie Gilroy) lined a shot off of Vicki’s left knee. Vicki was able to recover and throw Kylie out but Mara scored and Vicki went down with a sore knee. 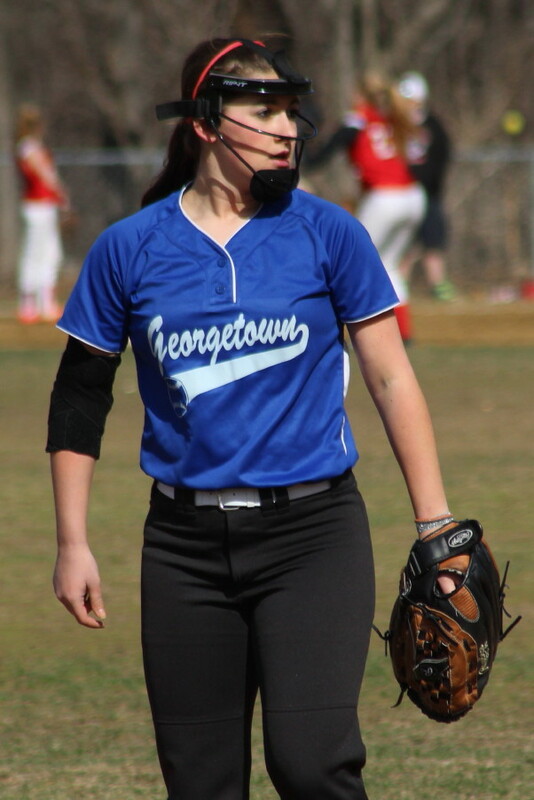 With backup pitcher Stephanie Gleason nowhere in sight, I’m not sure what NHS Lori Solazzo would have done for pitching if Vicki couldn’t continue. 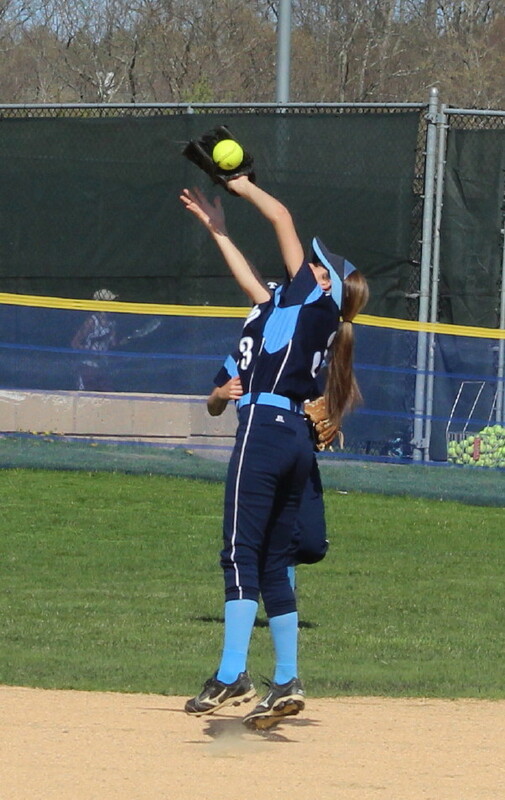 But Vicki did continue and immediately had another liner hit at her which she caught ending the inning. 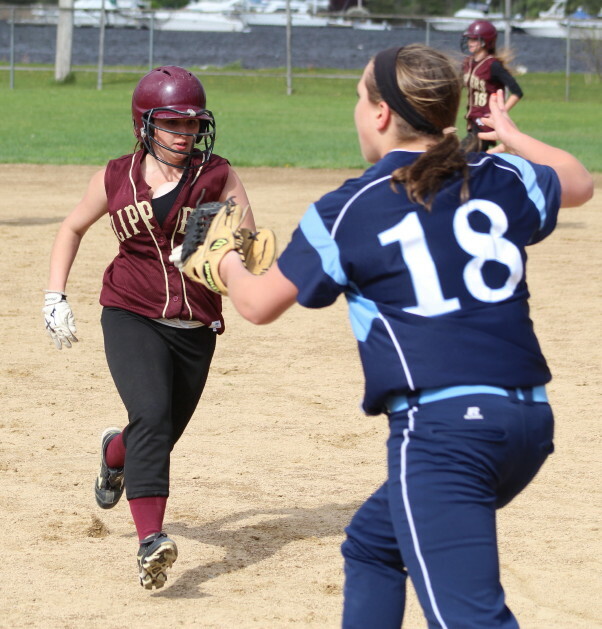 Newburyport put up three runs of their own in their half of the first. 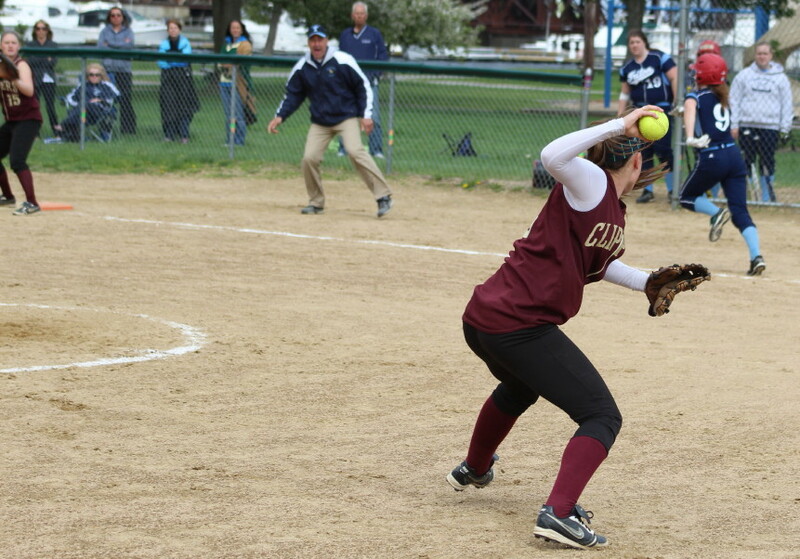 Morgan Johnston beat out an infield hit and Carley Siemasko singled on the ground to right. Shelby O’Brien followed with a high fly deep to the right-field corner. 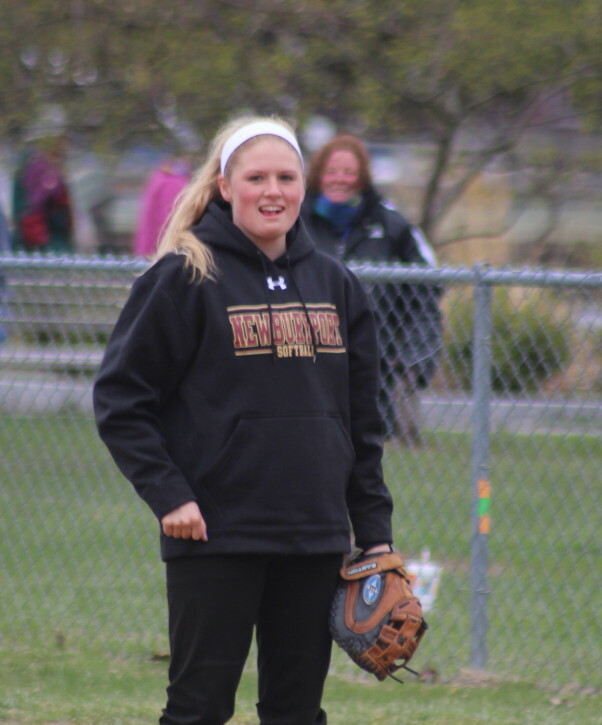 Rightfielder Cailin Fraser had trouble finding the ball because it was over her head, hit high, and influenced by some gusty wind. 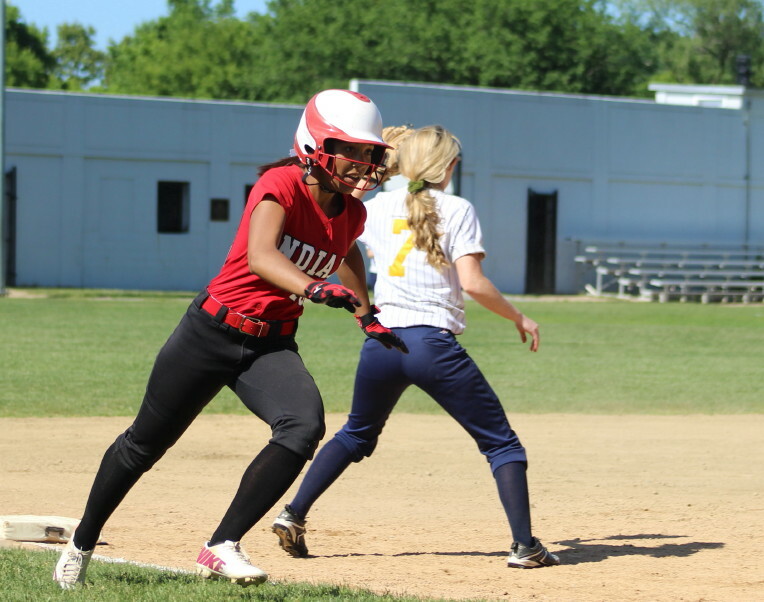 Shelby was into third before the ball was even picked up and reached home easily. 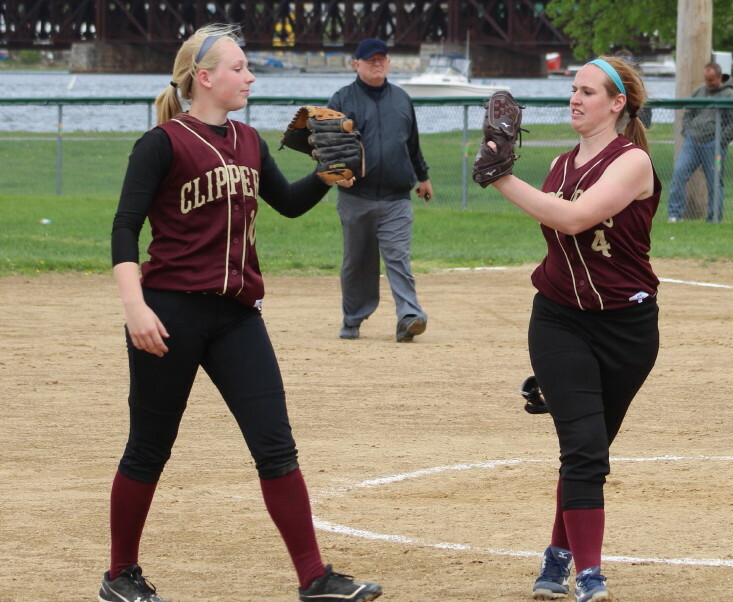 The Clippers would load the bases after the homer but Mara Spears struck out Shianne Sneider to limit the damage to three runs. Triton got a run back in the second. 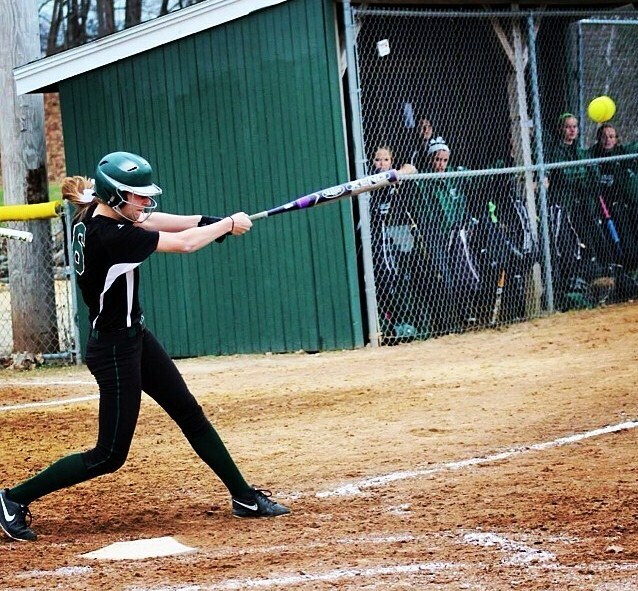 Sophomore Olivia Lees singled in the hole with two outs and was driven home by Taylor Johnson’s double. 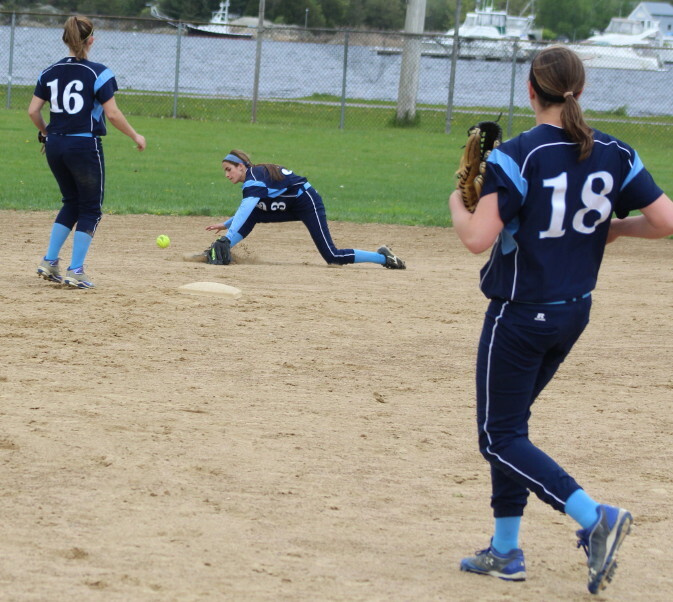 The inning ended with Taylor being tagged out by Newburyport third baseman Meg Stanton. The Clippers added two runs to their 3-2 lead in their half of the third inning. 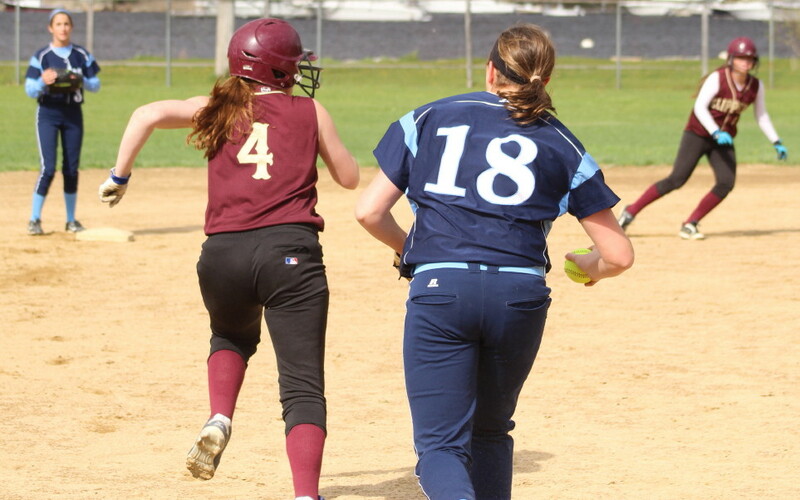 Meg Stanton singled and Molly Kelley walked before junior Shianne Sneider hit an RBI single to right. Ashley Hodge followed with an RBI double to left. That 5-2 count would hold up the rest of the way. 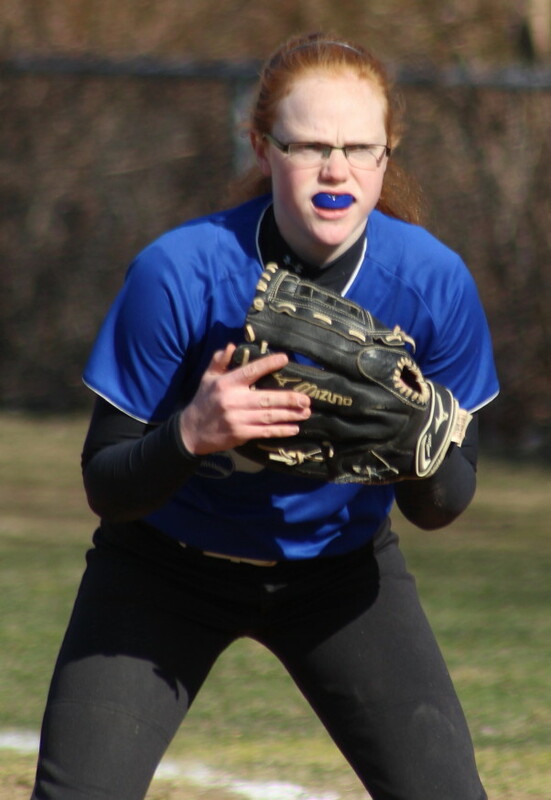 There were few baserunners as the pitchers (Vicki Allman & Mara Spears and later Haley Johnson) threw strikes and had flawless defense behind them. Weather? We had the Big Three in this one: cloudy, rainy, and sunny. I actually watched quite a few innings from my truck! My only regret was that Shelby’s homer was hit during the rainy part of the game and my camera was staying dry in my truck. Casey Barlow, Kendra Dow, and Maddy Stanton were on hand to support their former Newburyport teammates. Triton plays its last game on Wednesday at Saugus.